My late husband loved Richmond. In the beginning of his legal career, he had lived in Richmond and worked as a clerk for a judge with the Supreme Court of Virginia. I’m sorry to say that I don’t remember the judge’s name. Wayne always seemed pleased that I could identify these homes at 60 paces. I would whip out the original catalog image so that he could see and compare the archival image with the extant property. He seemed to truly enjoy this. In October, I gave a well-attended talk in Onancock, Virginia (Eastern Shore). That was a good talk. Standing in front of that crowd, I felt alive again. My brain started coming back online. Old neural pathways fired up again. My heart felt a surge of joy it hadn’t experienced in some time. It was a lovely memory of who I was, and who I could be again. My dear friend Dale tells me that maybe it’s time to expand my horizons. He’s usually right about these things. The revised (and improved) Penniman book will be out soon. And after I do a little promoting and lecturing on that topic, maybe I can find a job at a local hardware store. I like hardware stores. If you read the captions below, you’ll find that surveying the kit homes of Richmond was a collaborative effort (as it always is). 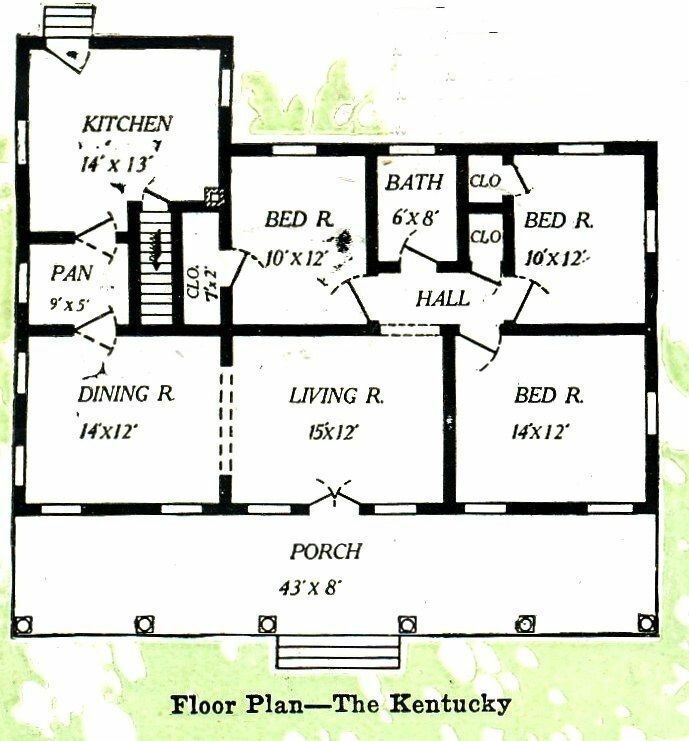 In many cases, I consulted with co-author Dale Wolicki on the Gordon Van Tine and Aladdin Houses, who affirmed that some of my “suspects” were (or were not) kit homes. Sometimes, I sent Rachel Shoemaker a few emails to ask if she recognized a design. Richmond artist Melissa Burgess went out into a busy road with her camera to get the perfect shot of a Sears Avalon for me. Other Richmond folks shared pictures with me (and are credited below). Molly Todd gave up an entire day to drive me throughout the older Richmond neighborhoods. This wasn’t just my work. This involved many people over a period of years. To read one of the original blogs on Richmond, click here. Read about Penniman and and Richmond here. This is one fine house: The Sears Sherburne. I remember the day I found this house. It was such a thrill! A Sherburne right here in Richmond! My middle daughter was flying into the Richmond airport and I arrived extra early so that I could tool around and find the kit homes before her flight arrived. This was Summer 2012. 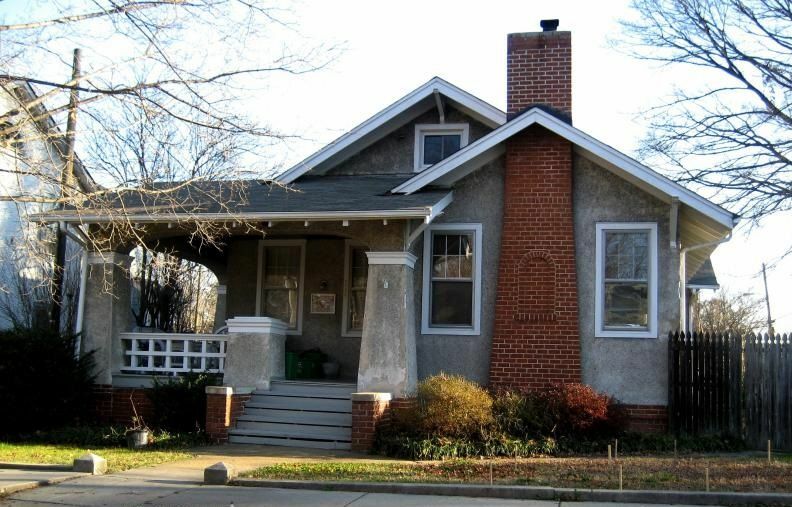 In 2014, I was invited to Richmond to give a talk on Sears Homes, and several delightful women accompanied me on that "tour of Richmond." The woman hosting the tour lived in this house. It tickled a memory, but it took me some time to identify this house. 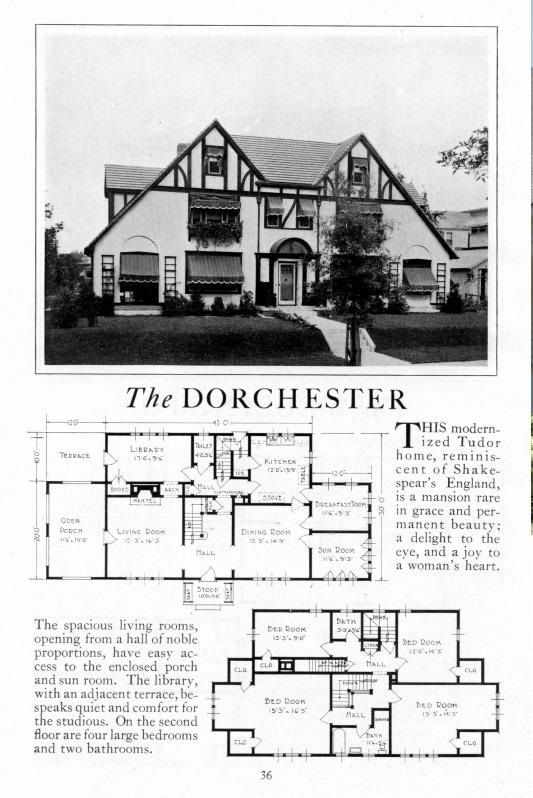 I spent countless hours in my home office, studying old catalogs to match Molly's house, but I found the house. It's a delightful Gordon Van Tine #628. 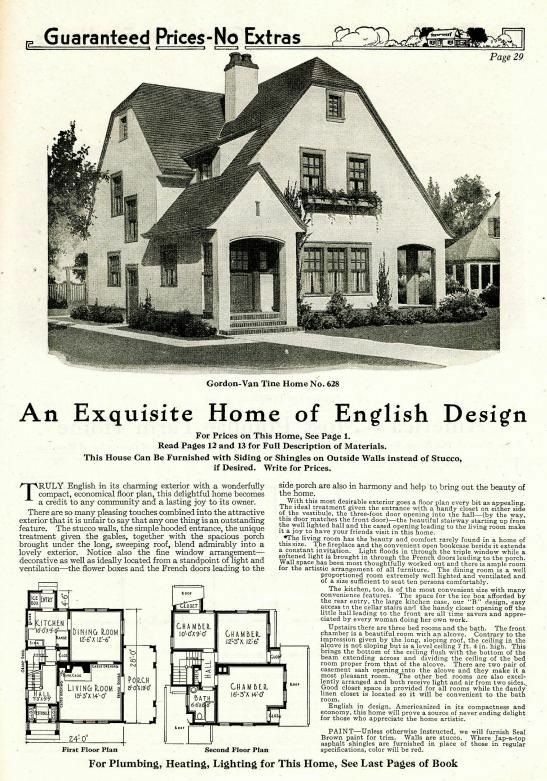 Gordon Van Tine, based in Davenport, Iowa, started selling kit homes in 1910. To my surprise, there are many Gordon Van Tine homes in Richmond. Here's a lovely example of a Gordon Van Tine#507. Photo is copyright 2012 Taber Andrew Bain and may not be used or reproduced without written permission. There I go again with that silly copyright stuff. I'm such a silly girl. This was one of my favorite finds, and quite memorable! As I recall, Molly was driving us around in her Lexus SUV and I saw this sweet house peeking out behind some heavy vegetation. Image above is courtesy of Rachel Shoemaker. 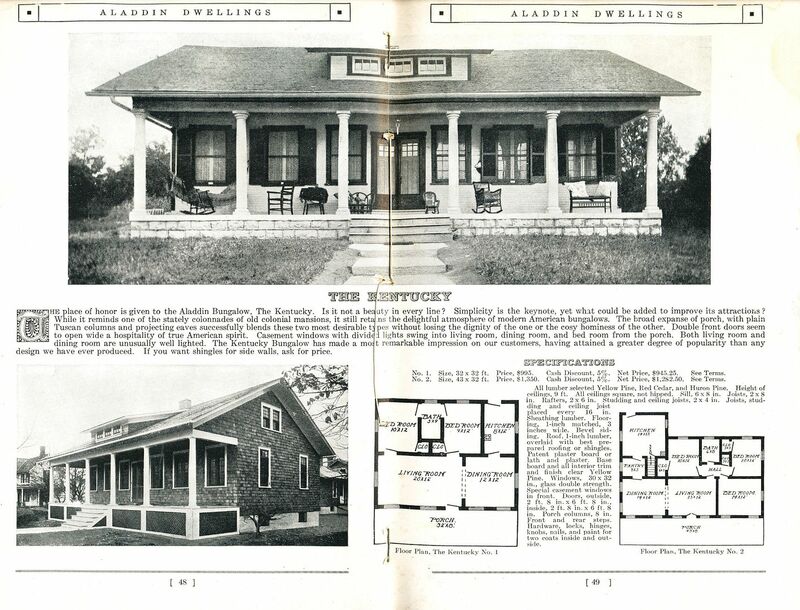 And thanks to a slew of helpful researchers, we were able to establish that this GVT is the very same house featured in the testimonial (lower left from the catalog image above). 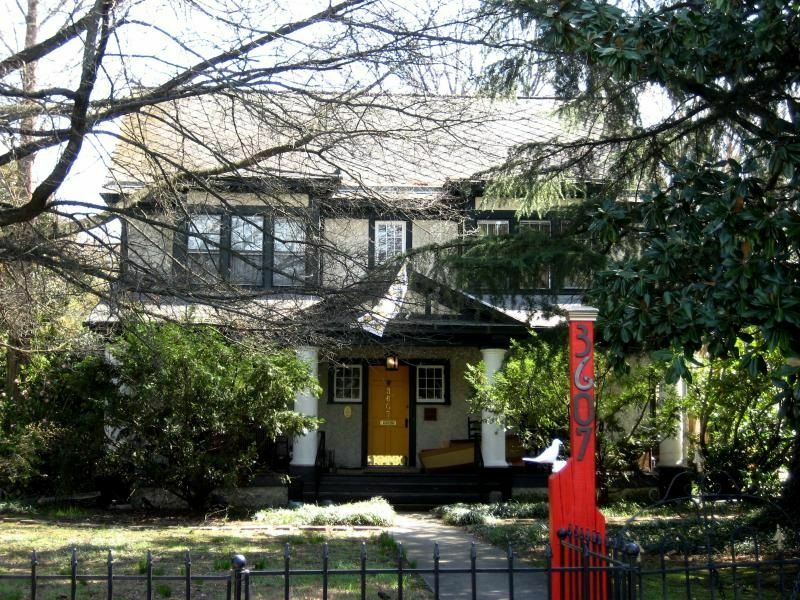 I well remember what a happy event that was - to find this very rare Gordon Van Tine home right there in Richmond. And Molly found this house on her own. 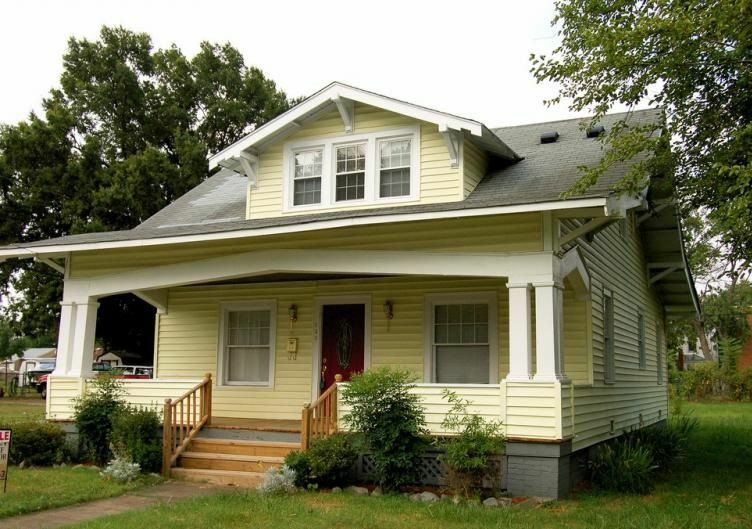 When she first contacted me about it, I could hardly believe that this house - offered by Lewis Manufacturing in Bay City - was in Richmond, Virginia. According to my buddy Dale, this is a very rare house, and that's not surprising. It's quite massive for a kit home! Photo is copyright 2014 Molly Todd and may not be used or reproduced without written permission. I've spent countless hours of my life playing with various artwork programs and creating "side-by-side views." This highlights the details around the front entry. Aladdin kit homes are more prevalent here in southeastern Virginia. Aladdin had a mill in North Carolina (about three hours from Richmond). 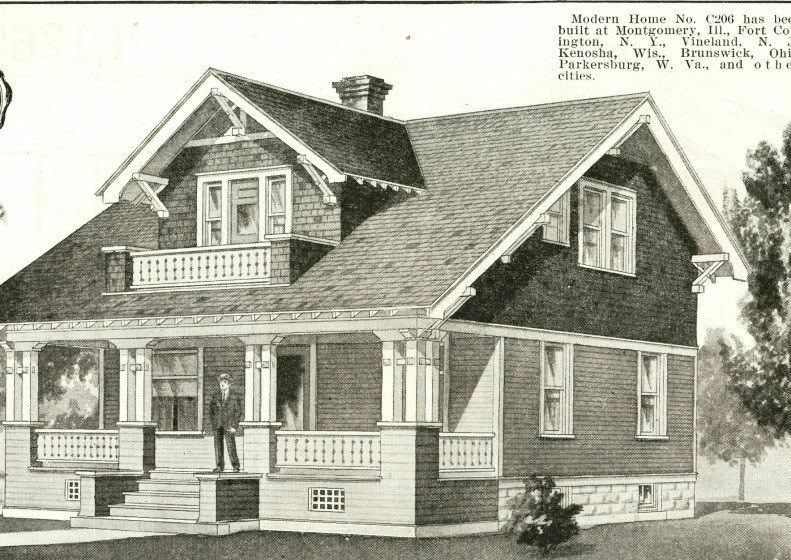 The "Madison" (shown above) was one of their best selling homes. And here's my little pretty in Richmond, Virginia. Harris Brothers was originally known as Chicago Wrecking Company, and later became "Harris Brothers Company." I'm not sure which trip it was when I first spotted this house, but it was a very popular model for Harris Brothers. It's a beautiful match to the original catalog page - stucco finish and all! We found a Harris Brothers 1513 in another part of town. Every detail on this Harris Brothers 1513 is spot on. Finding this kit home offered by Aladdin was another happy moment in Richmond. 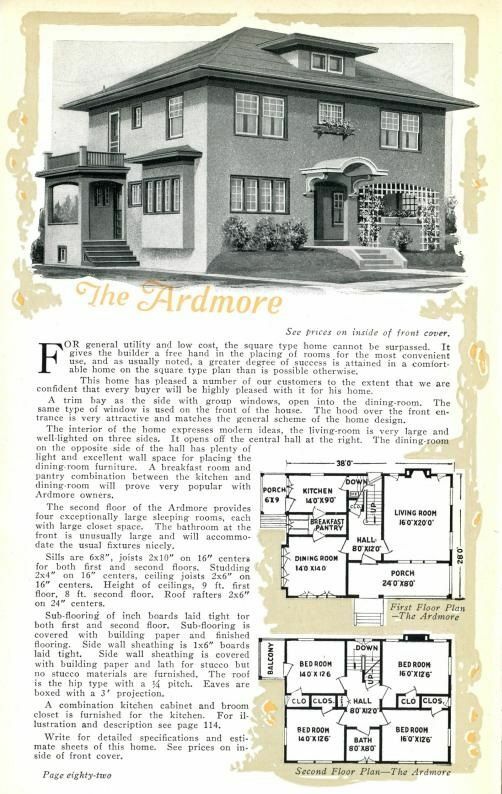 I wasn't sure that we'd found this rare "Ardmore" so I corresponded with my co-author Dale, and he affirmed that it was the real deal. When I spotted this house, I had Molly go forward, and backward, and forward and backward, as I struggled to eyeball the many details. She was a wonderful chauffeur and as I recall, we circled the block many times until I was satisfied with my many pictures. The very popular Sears "Osborn" was found in Richmond. 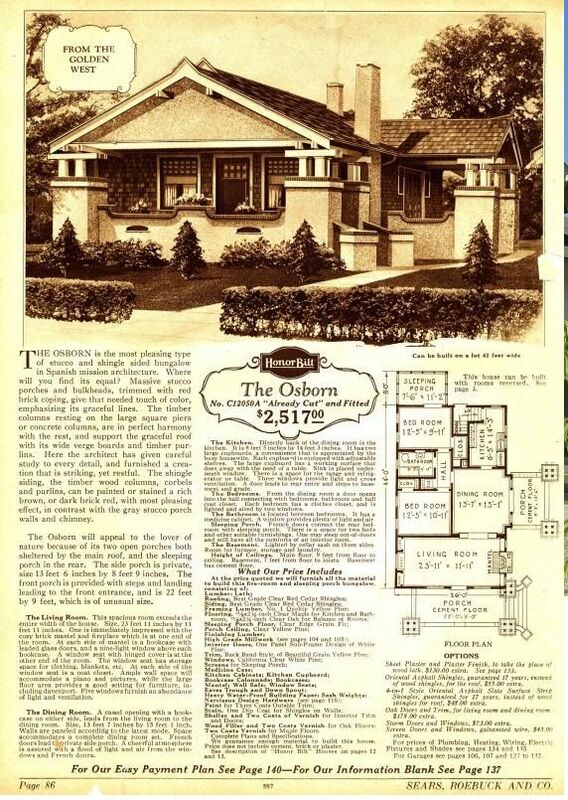 This Sears Osborn looks much like it did when built in the 1910s. 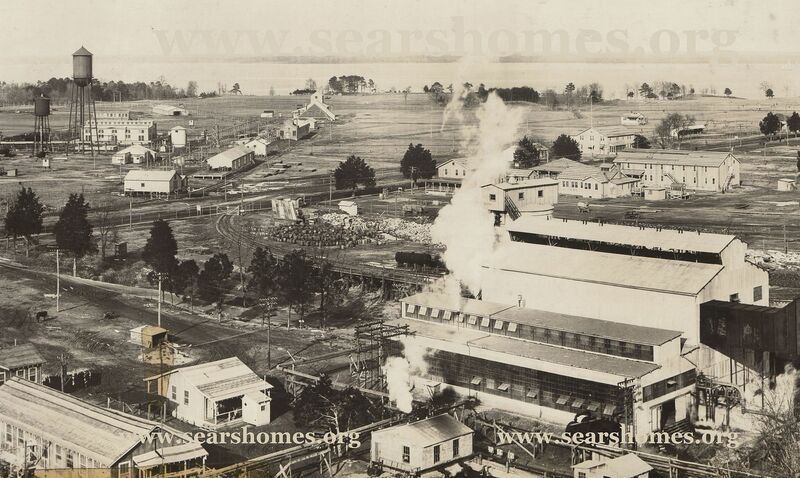 Several Sears "Avalons" were found throughout Richmond. Check out the detail on the chimney. Those three vents on the cross gable are also distinctive. My oh my, what a match. And thanks to Melissa for taking that ladder out to that road for the perfect shot! Picture is copyright 2014 Melissa Burgess and may not be used or reproduced without written permission. So there. 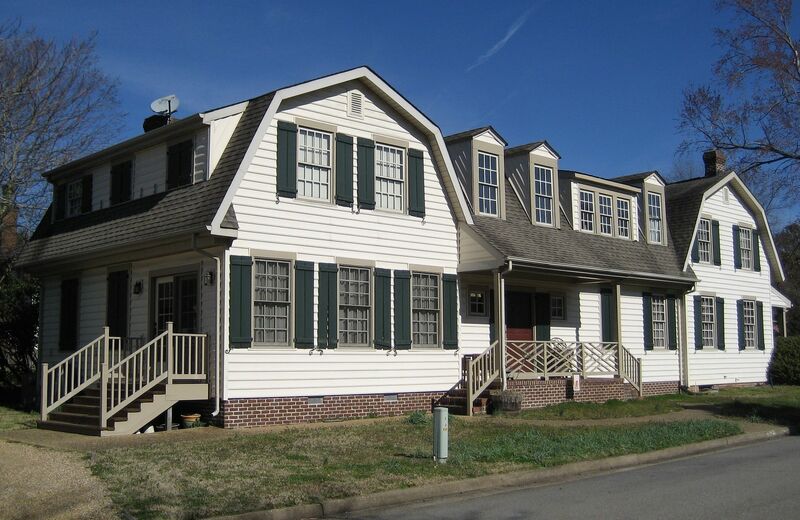 Another Avalon in Richmond, Virginia, also a delightful match to the catalog image. This is my favorite Avalon in Richmond. It retains its original details, right down to the railing! The Sears Westly was one of their most popular models. 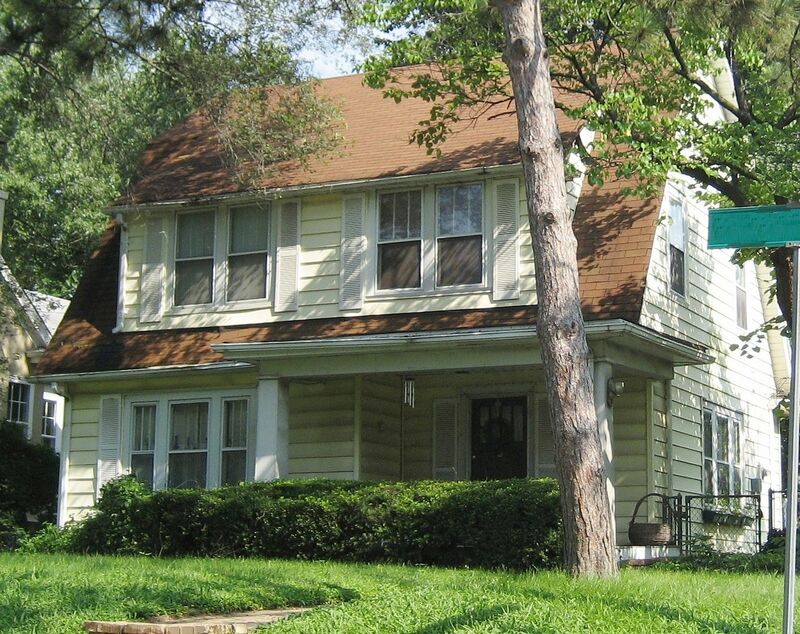 If a neighborhood has only five Sears Homes, chances are one of them is a Westly. I identify so well with this Westly. It's had a hard life and bears a few scars, but it's still standing. 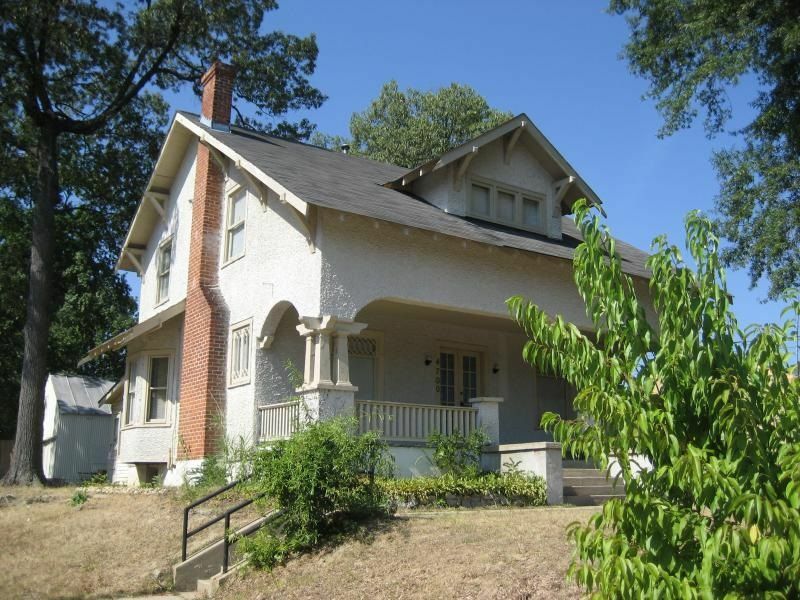 This is another very rare pre-WW1 Sears Home. I've seen only one other "190" and that was in Illinois. The polygon bay - first floor and second floor - is its defining feature. Also notice the cornice returns on steroids. 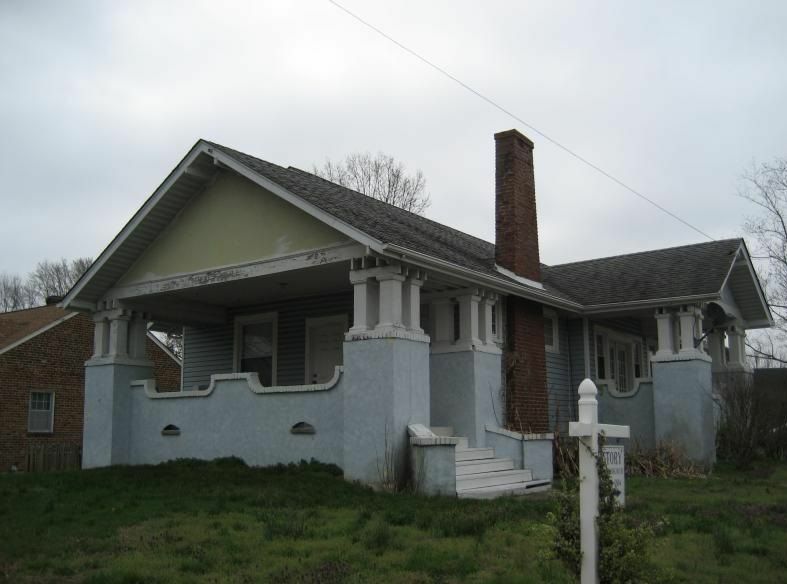 This house (as is shown in the catalog) has a stucco finish. 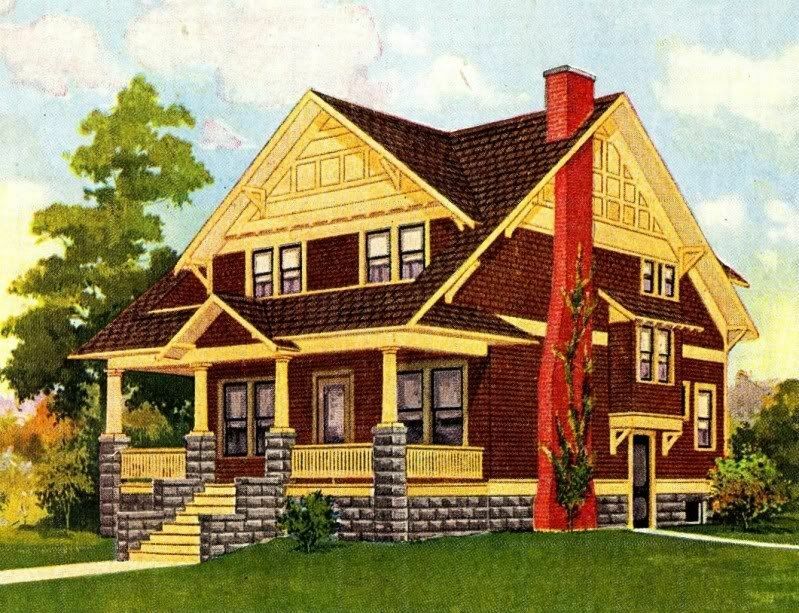 The Sears Strathmore is one of my favorite designs. 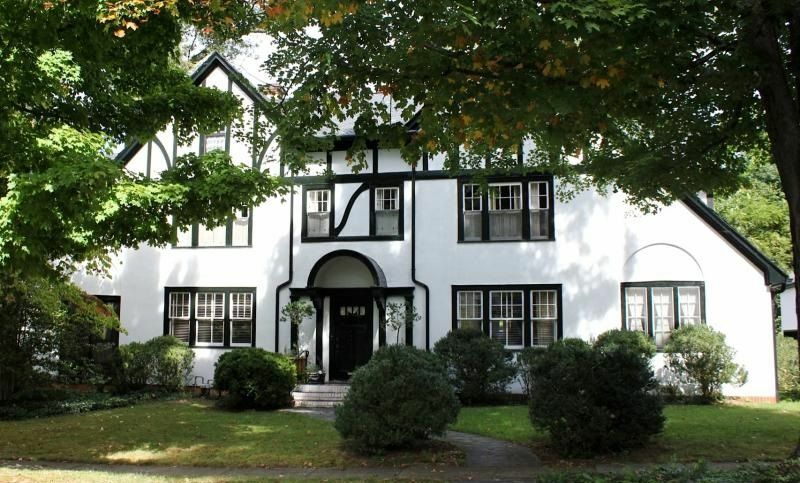 This neo-tudor is so pretty and has such pretty lines and is well proportioned. My husband and I were driving through Richmond together when I spotted this Strathmore. 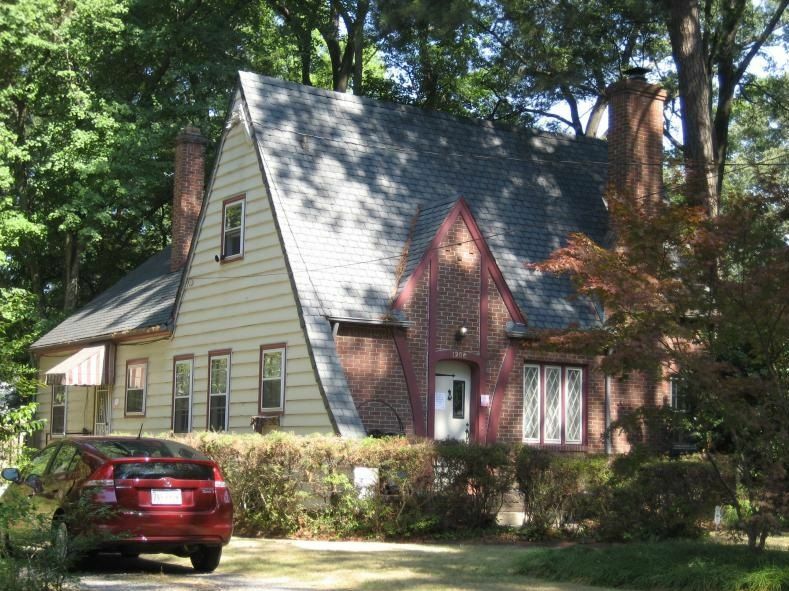 It's in beautiful condition and it has a Buckingham Slate roof. Buckingham Slate is the finest slate roof, and weighs about 1,400 per square. 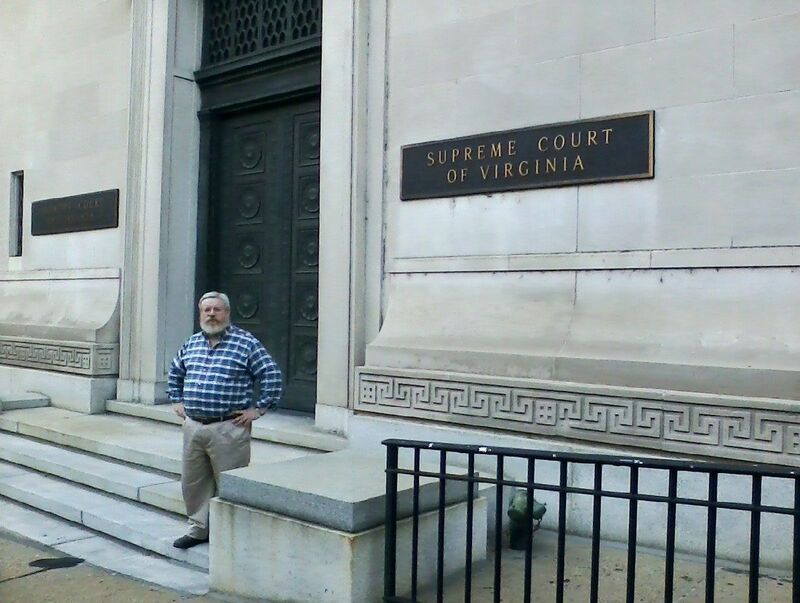 Sometime in early 2014, Wayne and I traveled to Richmond, where he appeared before the Supreme Court of Virginia to try a case involving a police recruit that died during training exercises. We arrived the day before and strolled around Richmond. We both went out shopping the week before to buy new clothes for this occasion. Never for a moment did I take him for granted. Never for a moment. 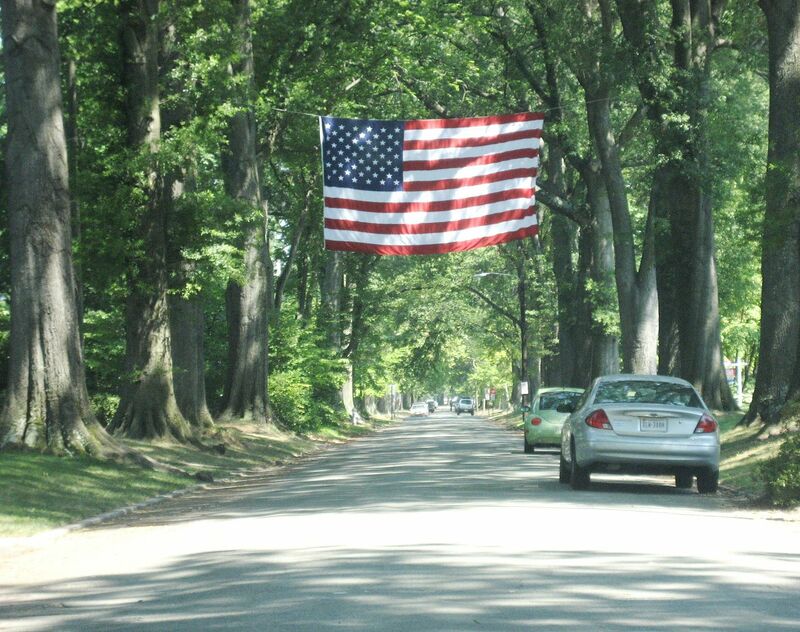 My first trip through Richmond was July 4th 2010, and it was my 51st birthday. Read about Pennimand and Richmond here. The People of Penniman: Personal Papers? 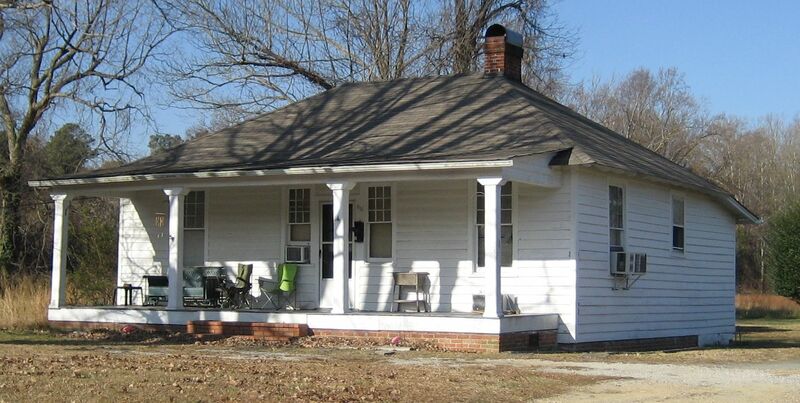 There’s no doubt in my mind that a “Pennimanite” left behind a personal reminiscence or journal or unpublished manuscript or something, telling about his war-time experiences at Penniman, Virginia. The problem is finding these people, and then finding their descendants, and then finding a written record. Thus far, I’ve had three good breaks, where wonderful vintage photographs of Penniman have come into my possession. Two of those good breaks came from people with relatives connected to Penniman. The third event was a fellow who purchased a vintage photo album from eBay, and later found me (and this website). Below, I’ve listed the names I’ve found thus far in the hopes that we might find these folks, and perhaps find a personal reminiscence of a Pennimanite. Within the tags (at the bottom of this blog) are more names. 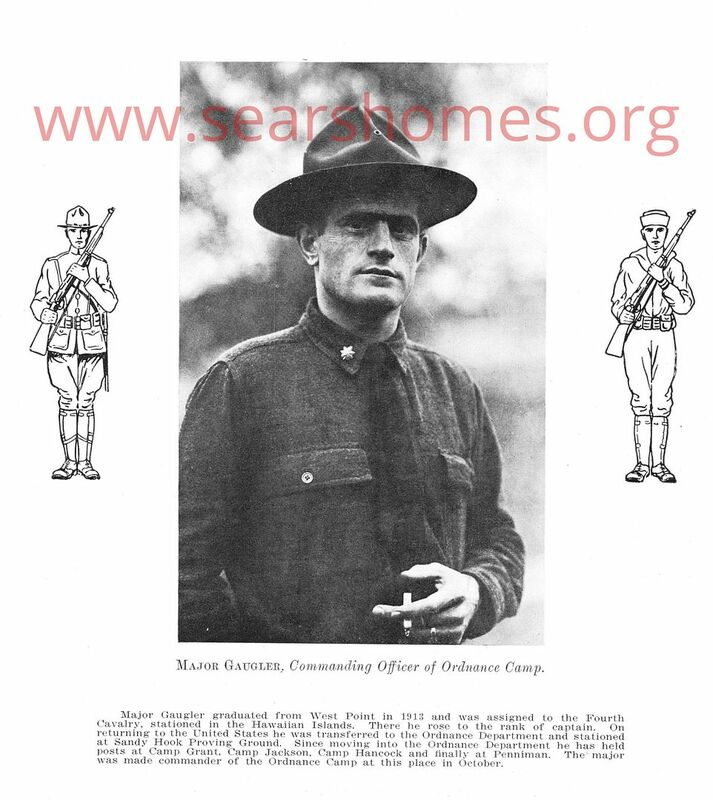 To read about the soldiers at “Camp Penniman” click here. Allshouse, Atkinson, Austin, Barnett, Bell, Benesh, Browne, Byrne, Casey, Cavanaugh, Cheep, Curry, Davidson, Davis, Doubille, Dunsworth, Fitzgerald, Gaugler, Gluss, Gohegan, Goodrich, Hazlehurst, Hess, Hoke, Huger, Huntley, Jenson, Krebbs, Loughborough, Luderlow, Ludqig, Marable, McCourt, McLelland, McMannus, Miller, Moser, Newcomb, O’briean, Odem, Osiff, Parkus, Pennee, Peters, Plumer, Rhodes, Shevlin, Stowe, Stumzi, Sykes, Tragsdorf, Trask, Van Dyke, Wadsworth, Walbauer, Walton (Benjamin Franklin Walton, from Hanover County), Wellford. 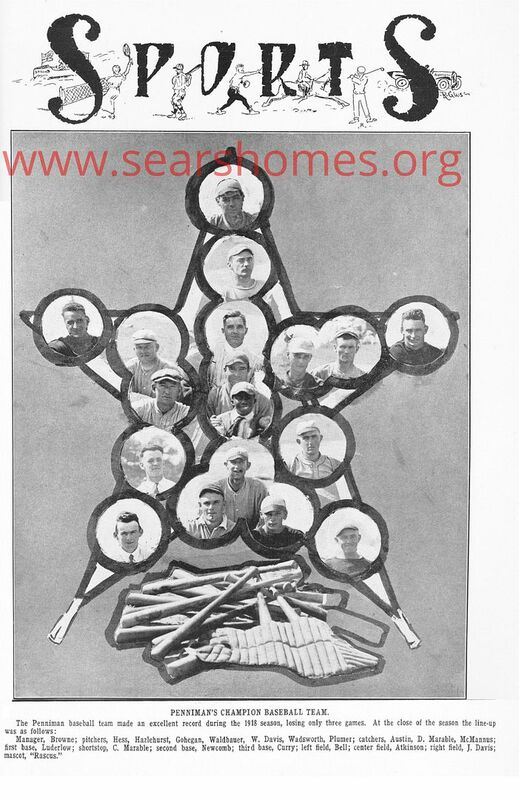 Thanks to the "Penniman Projectile" (December 1918), we now have several names of the people at Penniman, including the members of the Penniman Baseball team! 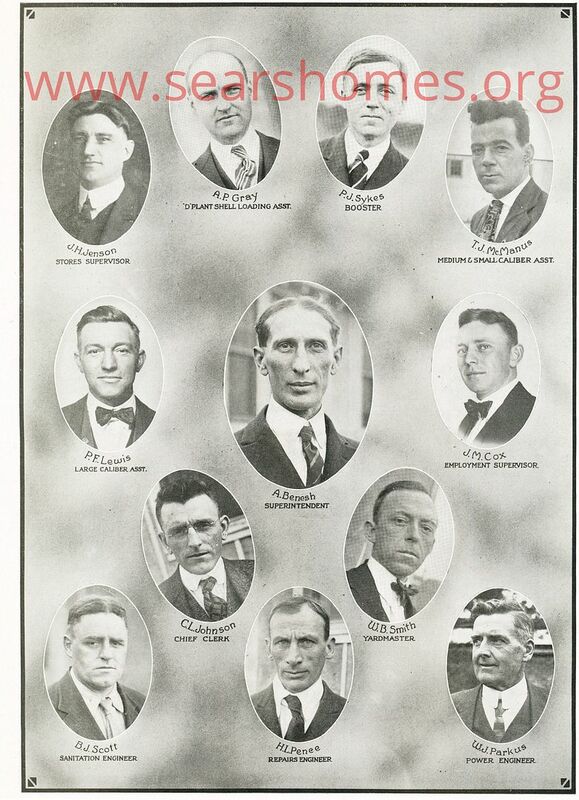 After spending more than six years studying Penniman, it's a delight to have faces for the "names" and it will be even more delightful to find some of the families of these men. 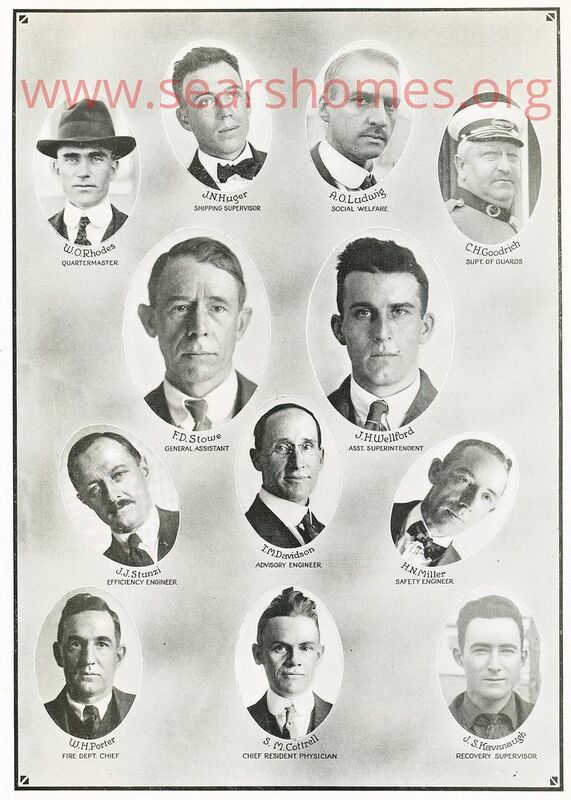 According to the Penniman Projectile, these were "prominent men" at Penniman. Mr. Benesh was the superintendent of the plant. After the war, DuPont sent him to China. Will we ever know the names of these many children at Penniman? 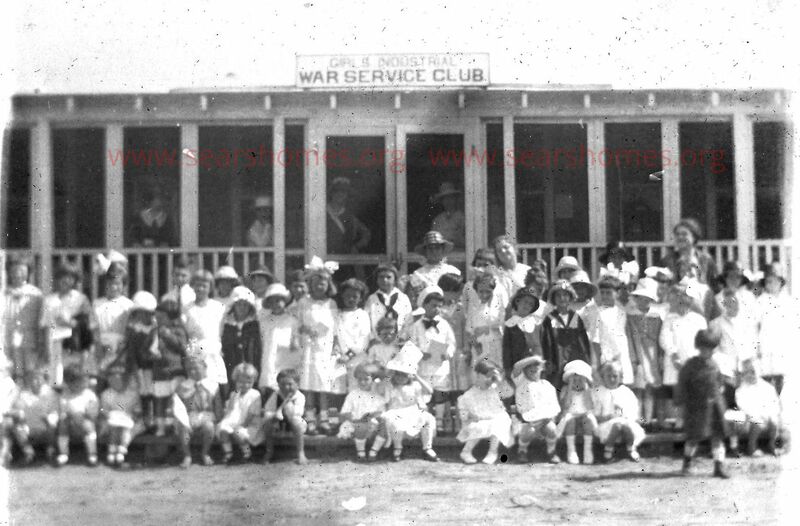 And an aside, the sign overhead says "Girls' Industrial War Service Club." None of these children would be alive today, unless they lived well beyond 100 years old. Ora C. Huston was the lead pastor at Penniman, and he and his wife ministered to Penniman's sick and dying, throughout the flu epidemic. Did he leave behind a published account? Did Major Gaugler leave behind a memoir of his time at Penniman? Bunny Trails: They’re one of the best parts of doing historical research. 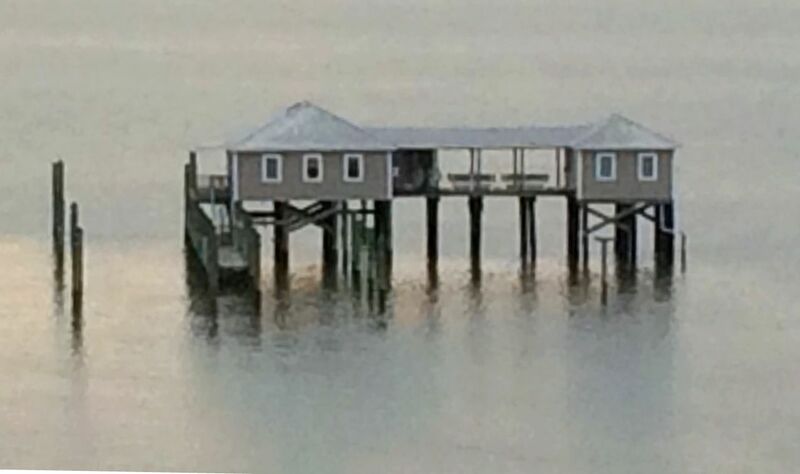 And while researching Penniman, Virginia, I read newspaper accounts from Pennimanites, talking about a house “sitting on stilts” in the York River. And while systematically reading through every single page (from 1916 to 1925) of the Newport News Daily Press, I found this gem: “[John Ross] Built His House On the Waters” (September 1922). It was an indepth article about John’s home in the York River. And then last month, it got even better when Carolyn Willis contacted me through this website, and shared some pictures from a family photo album of Joseph and Ola Whisnant. She’d found the word “Penniman” on the old snapshots, but didn’t know exactly what a Penniman was - until she googled the word. Carolyn’s photos showed me pictures of day-to-day life within Penniman, and provided an incredible peek of life inside the village. Each of the 22 pictures was a treasure, and I’m so grateful that Carolyn found me, and was willing to share those pictures. John E. Ross is wiser than the man who ‘built his house on the sands,’ as related in the Bible, to have it destroyed when the winds came. The windws may come, storms may kick up a sea in the York River, and the ice-packs of winter may crunch and grind around his abode, but it will stand the buffeting of every day assaults that nature can make. At least it has done so for years past and appears to be as firm and safe as when first it rose above the waters…Mr. Ross and his family live in happiness and security in one of the oddest abodes in this section. Mr. Ross is a well-to-do oyster planter and located near here years ago. He conceived the idea of building a bungalow on stilts in the York River, far enough out to escape the discomforts on inshort. Pilings were sunk and upon this structure arose the neat little house that has long been the home of his family. He solved the water problem by sinking a deep artesian well and has one of the best over-flow wells in this section. A fast motor boat tired up at the foot of a pair of steps leading down in the water solves the transportation problem. The Ross home, located almost at the mouth of King’s Creek, several hundred yards out in the water, is one of the most unique in this section and never fails to attract attention from visitors. It is just off Penniman. Probably 20 feet off water is to be had the house, and all all Mr. Ross has to do when he wants fresh fish for a meal is to drop a line out the kitchen window and wait for a bite. They live happily in peaceable surroundings, not disturbed even by their neighbors’ chickens (September 8, 1922). 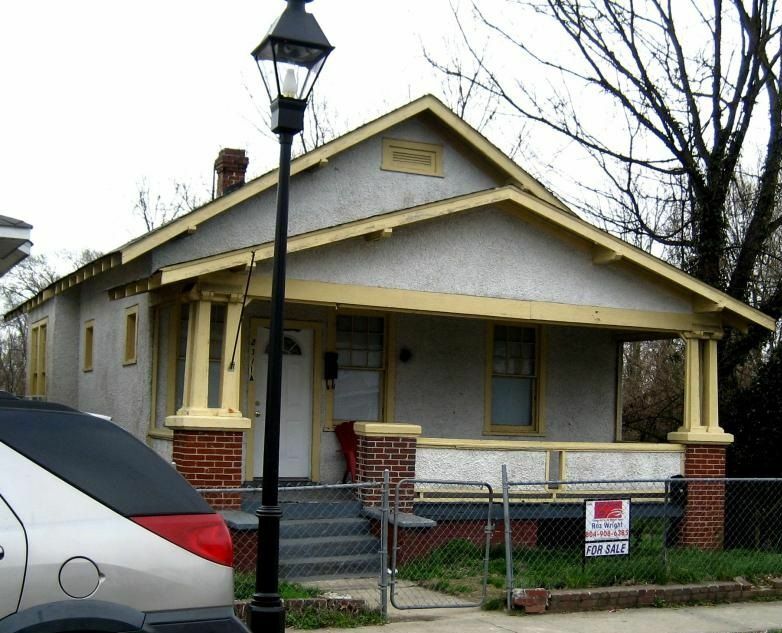 A local genealogist found this additional information on John Ross: John Edward Ross left this house sometime in the 1920s and in 1930, he was living at 24 Channing Avenue (the Cradock section of Portsmouth). 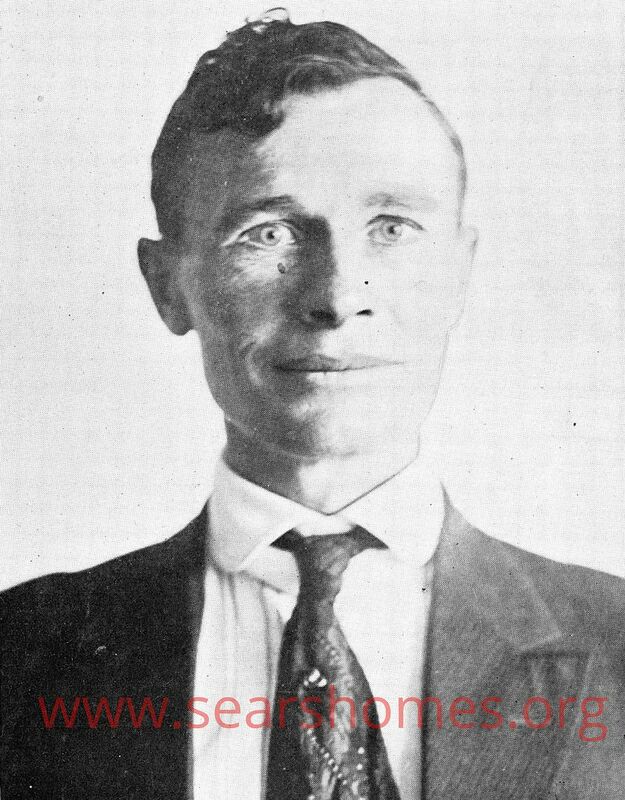 In 1910, he was a widow with a child and living with his father. 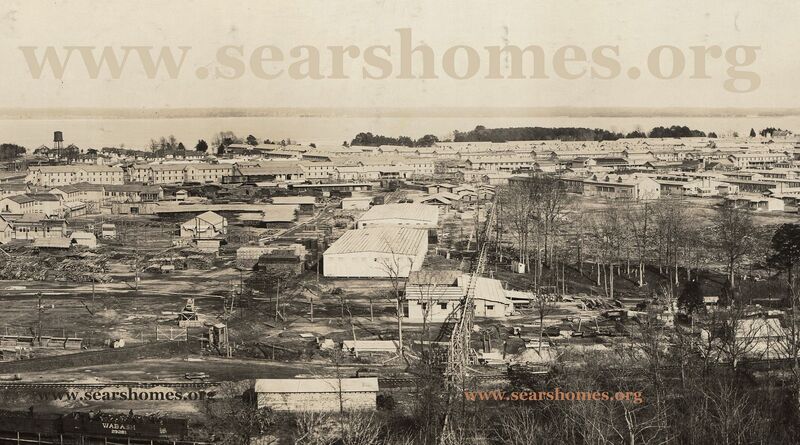 By 1920, John, wife Grace and 16 year son Edward Ross (by John’s 1st wife) were living on the York River. 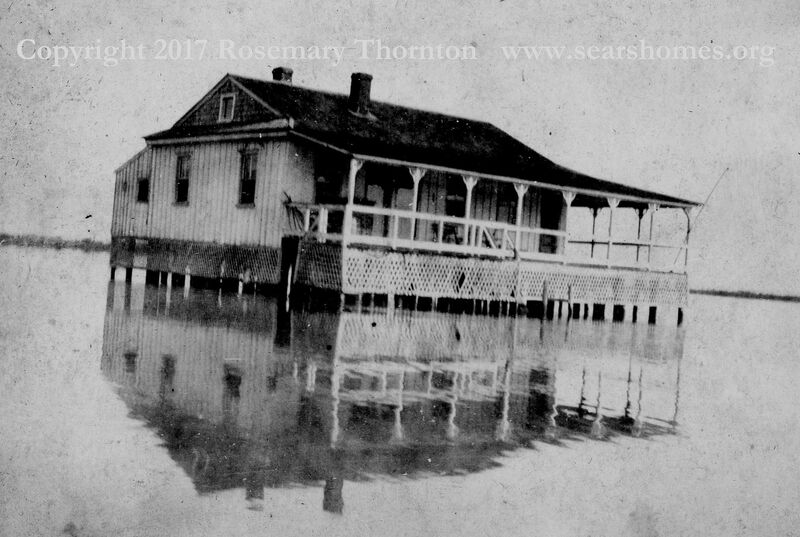 The Hurricane of 1933 destroyed a tremendous amount of property along the York River, and this bungalow on stilts was surely one of the houses that became flotsam. Thanks to Carolyn and the family of Joseph and Ola Whisnant for the pictures shown below. Learn more about Penniman here. 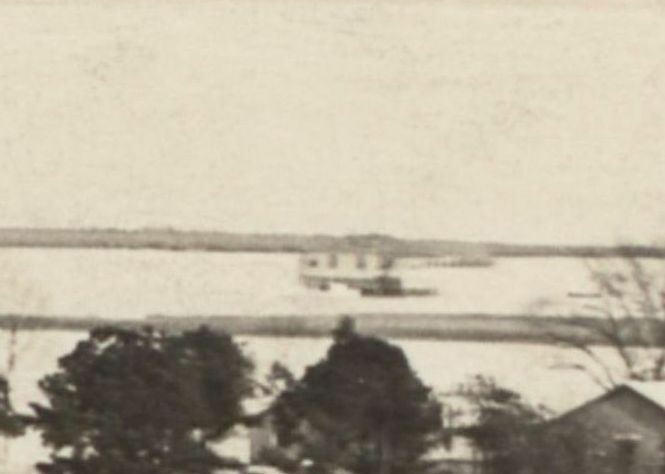 The panoramic image of Penniman shows a house out in the York River, not far from the Penniman Spit. Image is courtesy Hagley Museum and Library. A close up of the "bungalow on stilts." Hagley Museum and Library. Here's a picture of John's house on the York River. According to the "Daily Press," it's at "the mouth of King's creek, several hundred yards out in the water, and is one of the most unique in this section. It's just off Penniman." Thanks again to Carolyn Willis for sharing this image. Photos are the courtesy of the family of Joseph and Ola Whisnant. I've never seen anything like the John Ross house but there is a duck-hunting club sitting in the middle of the Nansemond River. 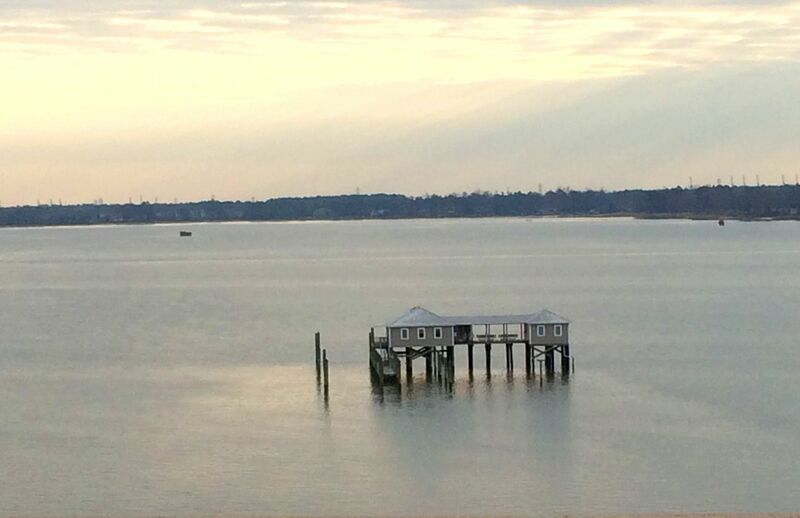 I took this photo from the bridge that spans the Nansemond River on an early Sunday morning as I drove to church in Suffolk. Fortunately, there were no cars behind me. Close-up of the duck-hunting club in the Nansemond River. I am curious as to how this building handles the discharge of waste. Do you know of any houses built in the middle of a river? Please send photos. I’d ask for an address, but that would be problematical. 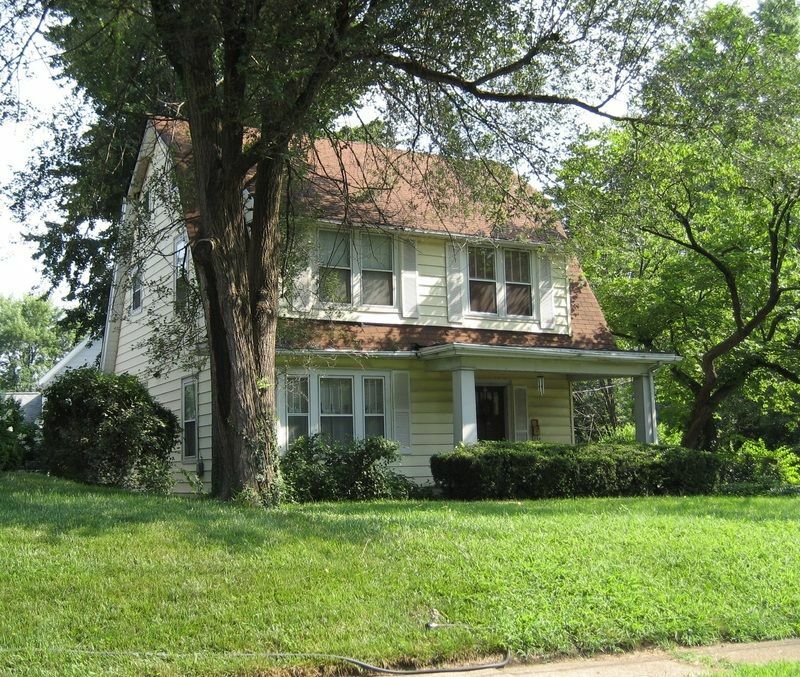 Webster Groves has a multitude of interesting old kit homes, and one of my favorite finds is this 1910s Dutch Colonial, offered by Lewis Homes. 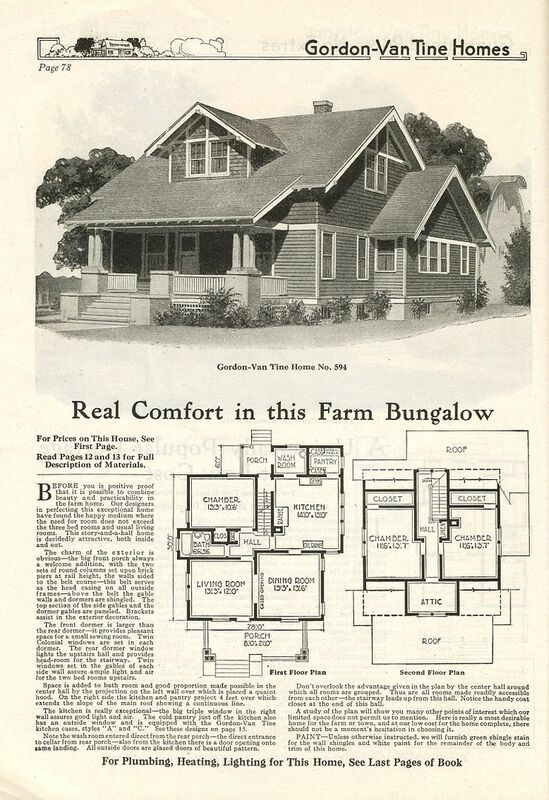 Lewis was one of six national companies selling kit homes through mail-order catalogs in the early 20th Century. 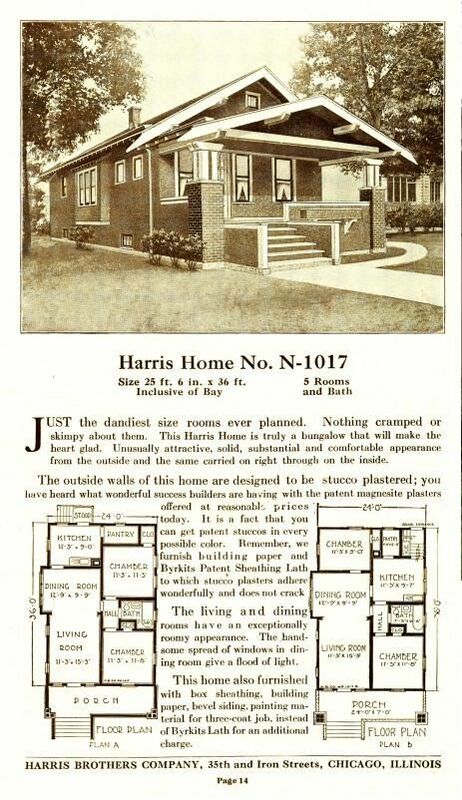 Sears was probably the best known of the kit home companies and Aladdin was probably the largest, but Lewis Manufacturing (based in Bay City, Michigan) was a serious contender. 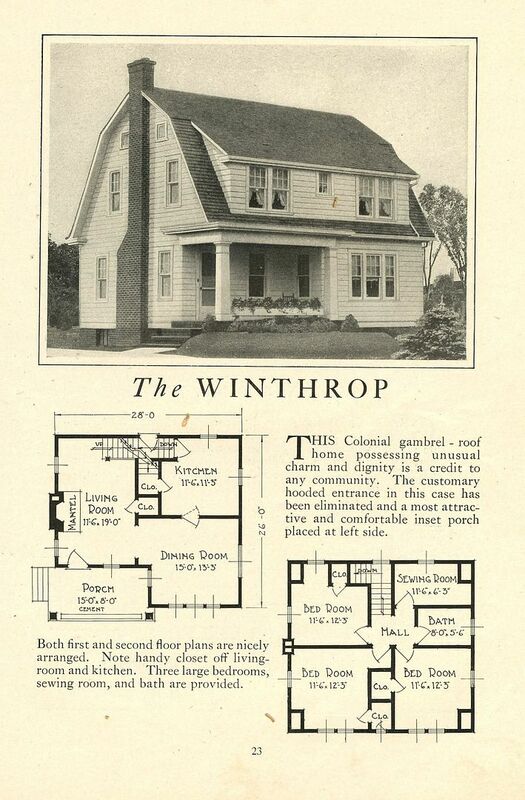 It’s been many years since I drove the streets of Webster Groves, looking for kit homes, and I’m not surprised that I missed a few back in the day, such as this Lewis Homes Dutch Colonial (”The Winthrop”). Last week, I was back in the St. Louis area, visiting family members and decided to revisit Webster Groves. I didn’t have time to do a thorough survey, but in the four hours I spent there, I found an abundance of kit homes. 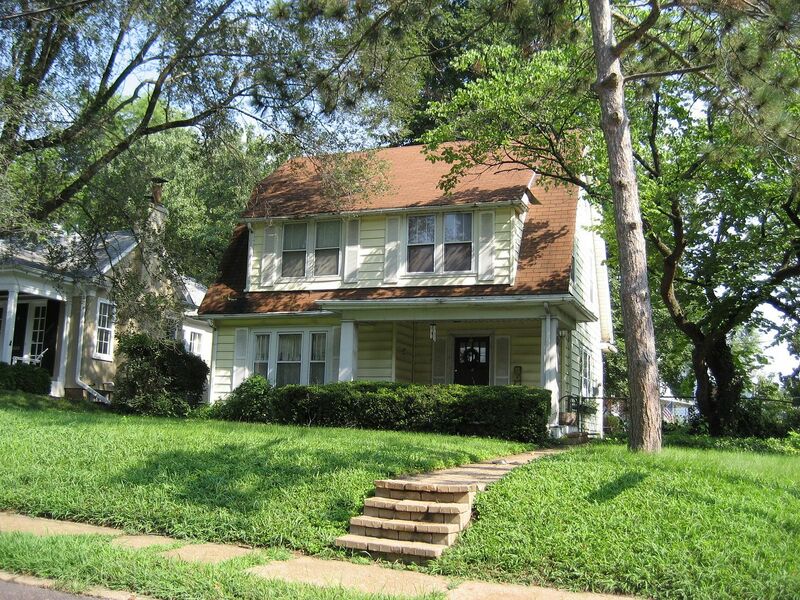 To read my prior blogs about Webster Groves, click here and here. 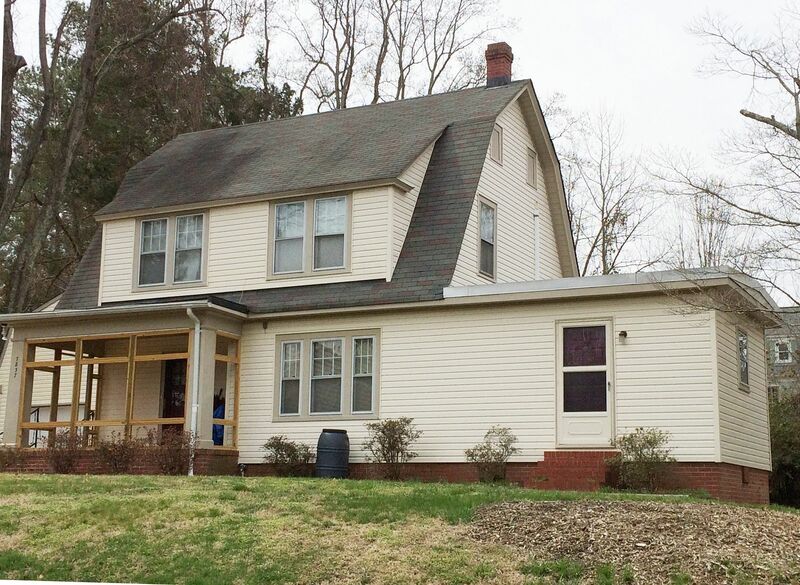 Interested in learning more about marked lumber on kit homes? Click here. 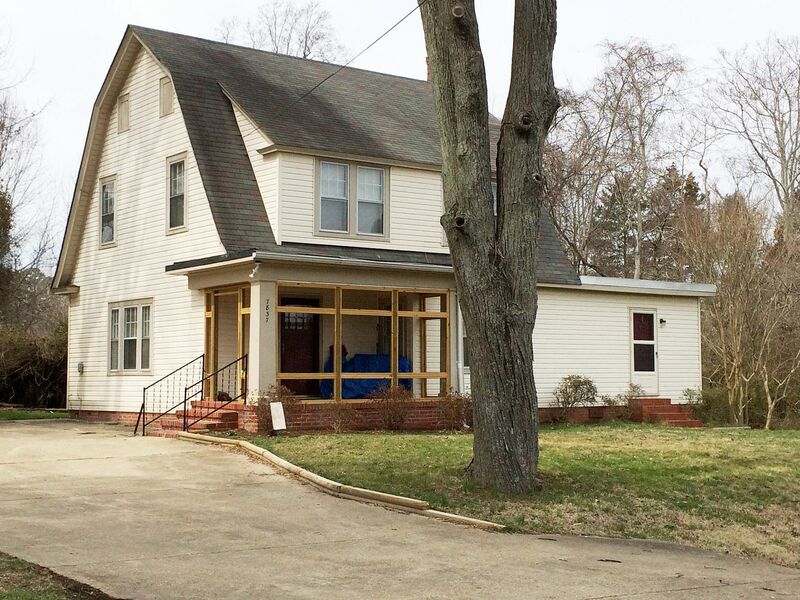 That inset front porch is a defining feature of the Lewis Winthrop. 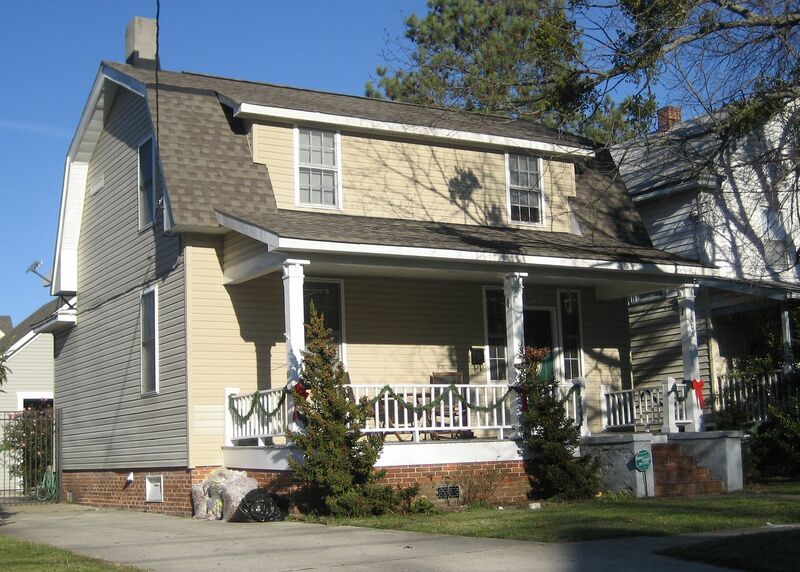 I sure do love a nice Dutch Colonial, and this one has a front porch! Oh my, what a fine-looking home! And it looks good from every angle! In this image, you can see those distinctive attic windows. Who wouldn't love coming home to this every evening? As philosopher Samuel Johnson wrote, "To be happy at home is the ultimate result of all ambition, the end to which every enterprise and labour tends." But here's where it gets frustrating. Here's a Lewis Winthrop I found in Toana, Virginia. 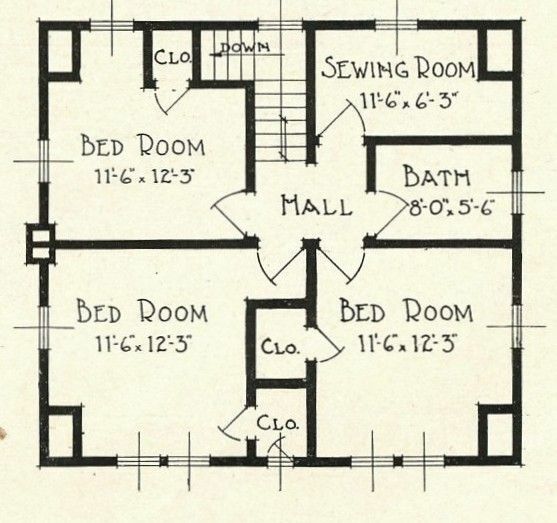 Like the house shown above, it has no fireplace on the side, but rather three windows. Is this a pattern book version of the Lewis Winthrop? 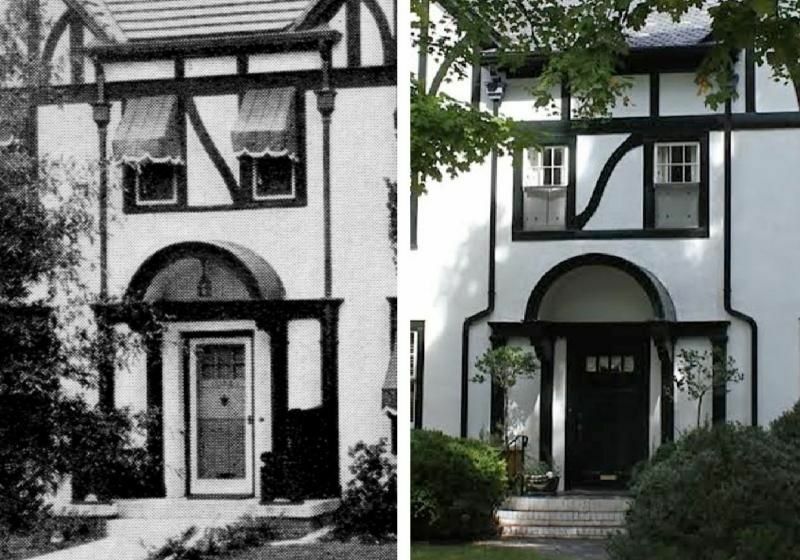 For now, I'm going to make an educated guess that these two homes are the Lewis Winthrop, because I haven't seen a pattern book match. But who knows! Time will tell! 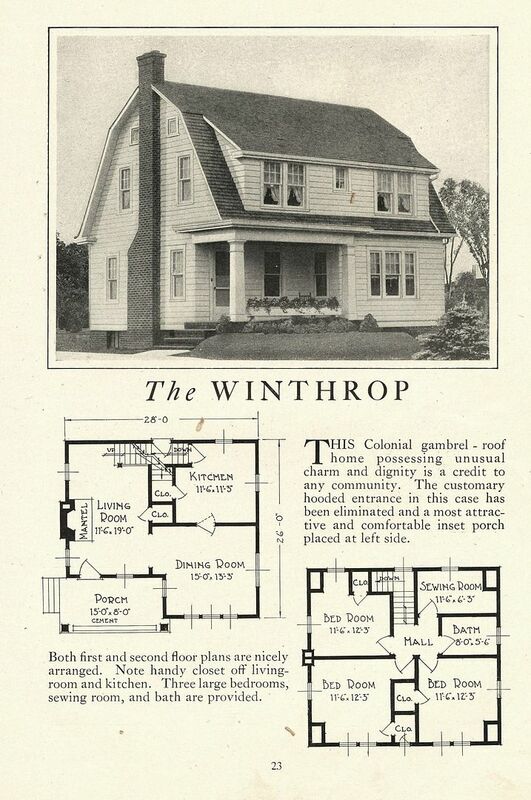 To read more about the Lewis Winthrop in Toana, Virginia, click here. Believe it or not, that title is not “word salad” or aphasia: It will make sense in a minute. As to the title, Toano (in James City County, another interesting term) was founded in the late 1800s, and this little fork in the road was originally known as “Burnt Ordinary.” (Yeah, it puzzled me, too.) Like so many of our modern terms “ordinary” meant something a little different 200 years ago. Whilst driving through the tiny town of Toano, I spotted this house and took a picture with my TV-phone (as my husband calls it). Best of all, it was my first sighting of a Lewis Winthrop, and it’s in beautiful shape! 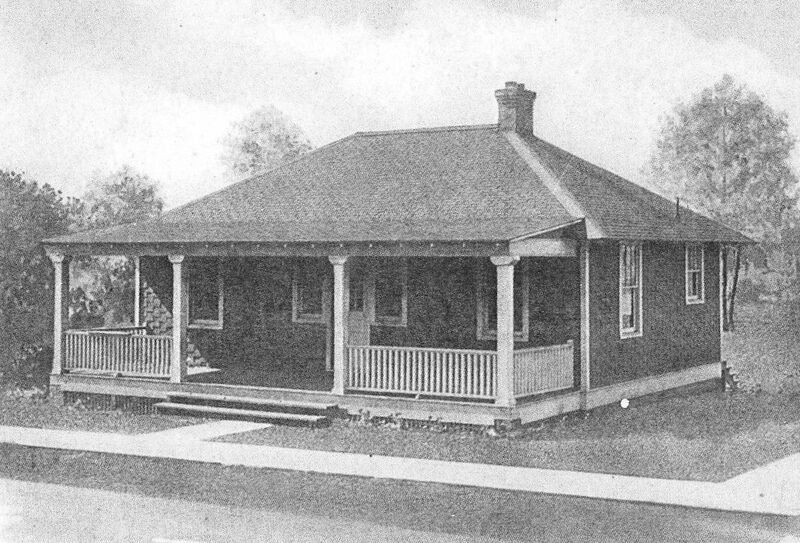 To read about another Lewis Home, click here. What’s a Penniman? Click here! As soon as I spotted this house, it tickled the neurons. I knew I'd seen it somewhere. This morning, I pulled out my catalogs and found it! 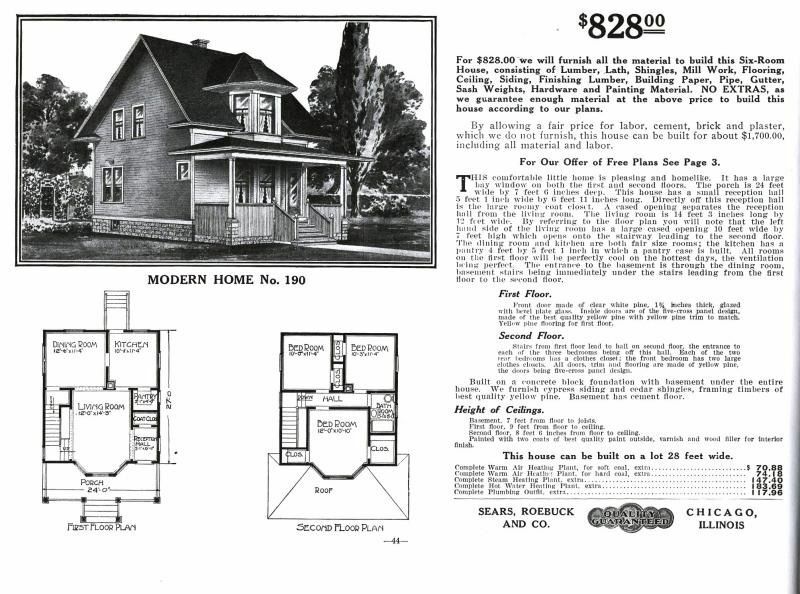 (1924 Lewis Homes). That indented porch was a feature that caught my eye. On the upstairs, the bathroom window is gone, which is not uncommon. These houses were built with tubs, and when it was time to put in a shower, the bathroom window often disappeared. 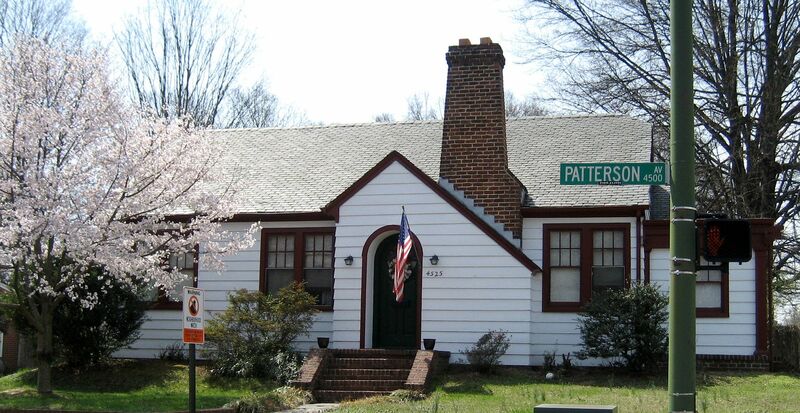 This home had vinyl siding installed, so its easy to cover up such changes. Notice also the tiny closet window is gone. Removing this window creates a little bit more space in an already tiny closet. The "sewing room" (on the right rear) has no window on the side, which is also a good match to the house in Toano. Close-up on the "sewing room" side. Unfortunately, that room addition on the side looks a lot like a mobile home. That darn tree made photographing the old house extra tough. Pretty house! And I'm pleased that I "guessed" the right angle for my shot! A delightful anecdote from 1921 tells us that, when the Penniman houses were shipped to Norfolk, some of the workers went into one of the houses - as it made the slow 36-mile trek across the water - and made a full breakfast, using the oil cook stove in the kitchen. That’s the kind of story that really makes history come alive. Several workmen crossed the bay on the first barge that brought the houses. They had an oil stove in one of the houses. They got hungry and cooked some bacon and eggs and heated some coffee. They enjoyed a meal cooked in one of the houses while it was being towed to Norfolk (December 24, 1921). 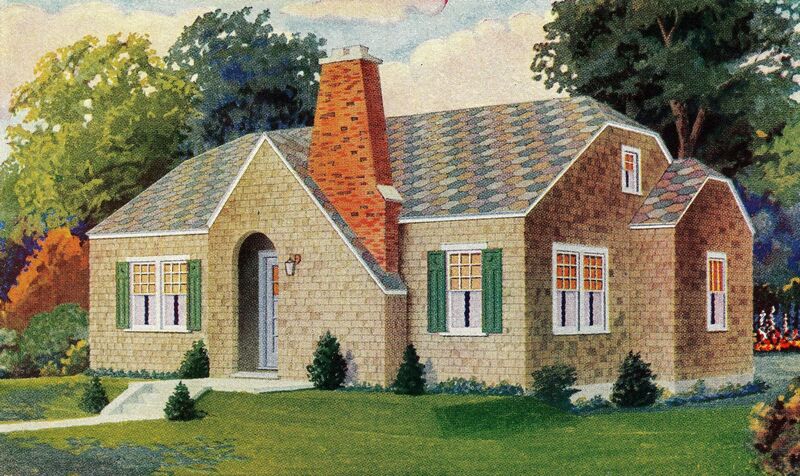 More than being an interesting tidbit, it also illuminates this detail: Every kitchen in every Penniman house, built by a three-party contract between DuPont, Hancock-Pettyjohn and the US Government, came with an oil-fired cook stove. 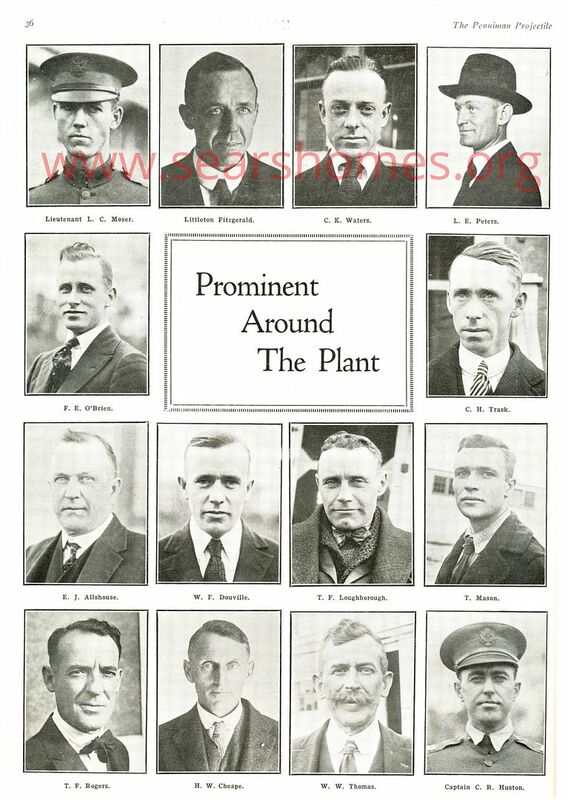 When America entered WW1, we were in such a mad rush to get these munition plants up and running that there wasn’t time to seek bids and wait for bids and open bids and investigate potential contractors, so DuPont was charged with finding a trust-worthy contractor and the government agreed to pay all expenses of construction plus 8-1/2%. The downside of the Cost-Plus Plan is that the more money the house cost, the more money the contractor pocketed. Put another way, it took away incentives for the contractor to be efficient. But I think there was more to this than just padding the price of a house. This was a munitions plant where there were lots of opportunities for lots of things to go boom. And when this contract for 200 houses was signed on December 31, 1917, the realities of the danger of TNT would be very fresh in everyone’s mind. Three weeks earlier, December 6, 1917, the SS Mont Blanc, a French freighter, had just left Halifax heading for Bordeaux, France, where it would deliver 5,000,000 pounds of war-time explosives. It was about 8:45 am when the Mont Blanc collided with a Norwegian ship, the Imo. Despite the slow speed (about 2 knots), there was a resulting fire on the Mont Blanc. Sailors tried desperately to extinguish the growing fire, but eventually abandoned ship. About 20 minutes later, the drifting vessel returned to the wharf, and moments later, there was an explosion on the Mont Blanc. According to the book, Unthinkable: Who Survives When Disaster Strikes and Why, the resulting blast shattered windows 60 miles away, and more than 1,000 people lost their sight due to flying glass. A tsunami eliminated a nearby community. All in all, more than 1,900 people died. During WW2, scientists working on the Manhattan Project studied Halifax because the magnitude of the explosion emulated an atomic bomb in so many ways. Not that anyone at DuPont would have needed any such reminders. The engineers and architects employed by the company would have been well aware of the grave risks of a single errant spark. Which also explains why each house had steam radiant heat, supplied by a central heating system. No risk of sparks from an independent residential coal-fired heating system. Which also explains why each house did not have a coal-fired or wood-burning cook stove: The risk of embers and fire would have been too great. 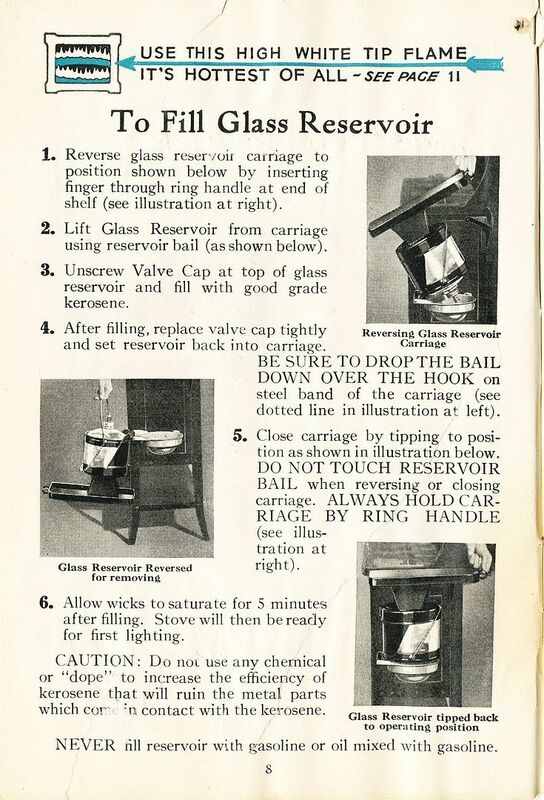 Which leads me to my question: It appears that - maybe - these late 1910s oil (kerosene) cook stoves didn’t require a chimney or any venting. As my friend Milton said, they appear to be similar to kerosene space heaters (which were hugely popular in the 1980s). There’s a reservoir of kerosene, fed by gravity to a burner with a large wick. The unit produces small amounts of carbon monoxide, but not enough to cause CO poisoning. If that’s true, why did every house in Penniman have a brick chimney? Heat was supplied by a central heating plant. 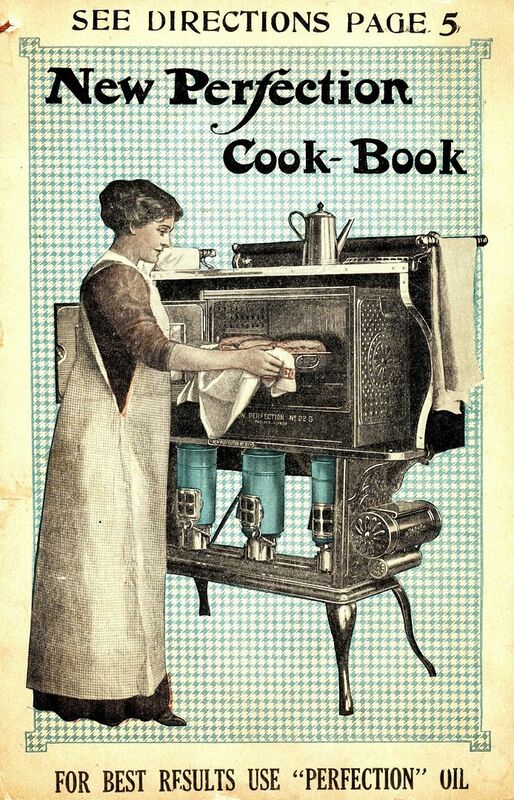 And I suspect (although I’m not sure) that the oil-fired cook stoves didn’t require venting. Was it more evidence of the inefficiencies of the “Cost-Plus Plan”? 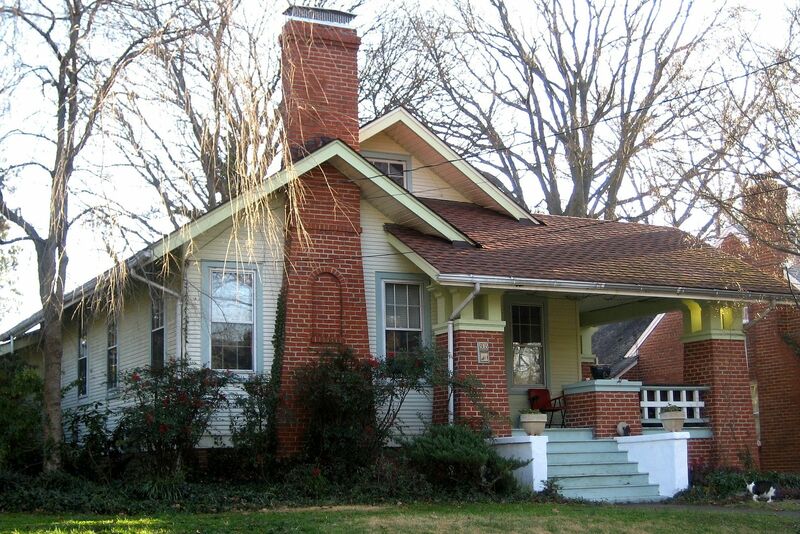 Every house gets a chimney, whether or not it needs it? 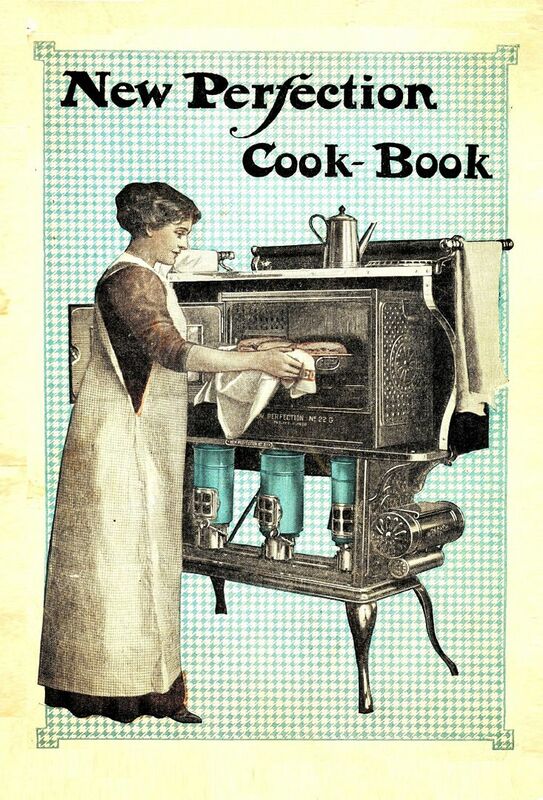 Or did the oil cook-stove need venting? To read more about Penniman, click here. 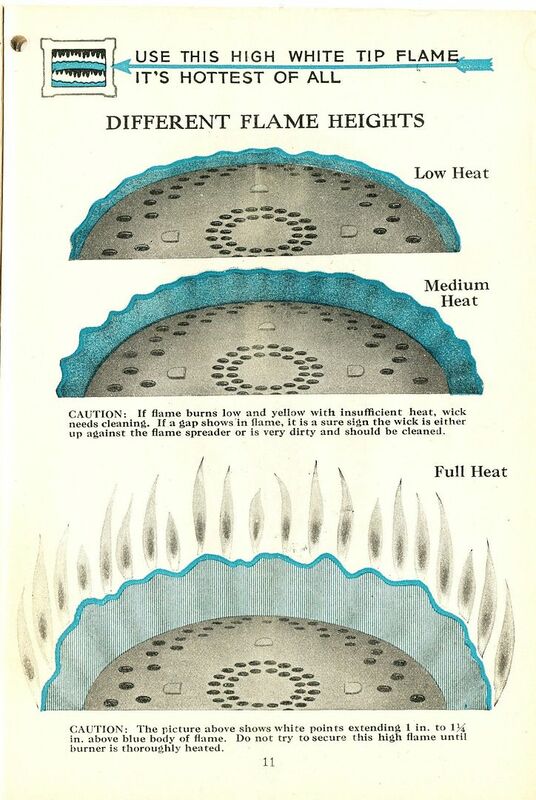 Perfection cook stoves were a big deal in the 1910s and 20s. 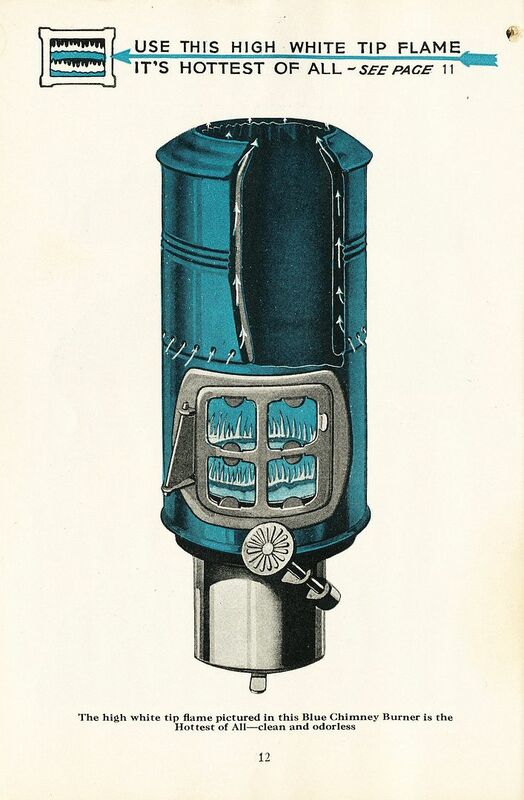 These blue cylinders were called "Chimneys" but they were the burner mechanism for the stove. Lighting these puppies didn't look simple. That does look pretty hot. This looks like a lot of work. Why not electricity? Two reasons, electric stoves required tremendous amperage and re-wiring a house to receive an electric stove wouldn't have been easy. 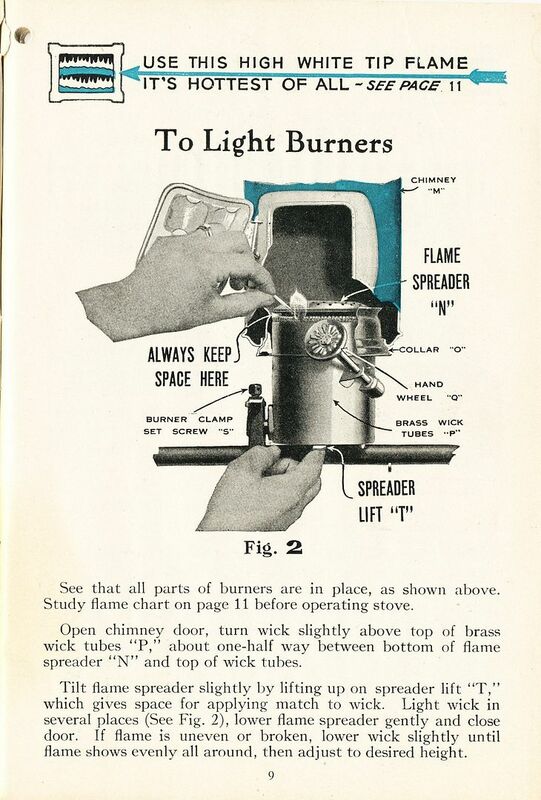 Electric stoves didn't get a foothold in the household appliance market until the 1930s. The last line is the best. Wow. Bacon. It's what's for breakfast. In a barge house. Virginia Pilot, December 1921. 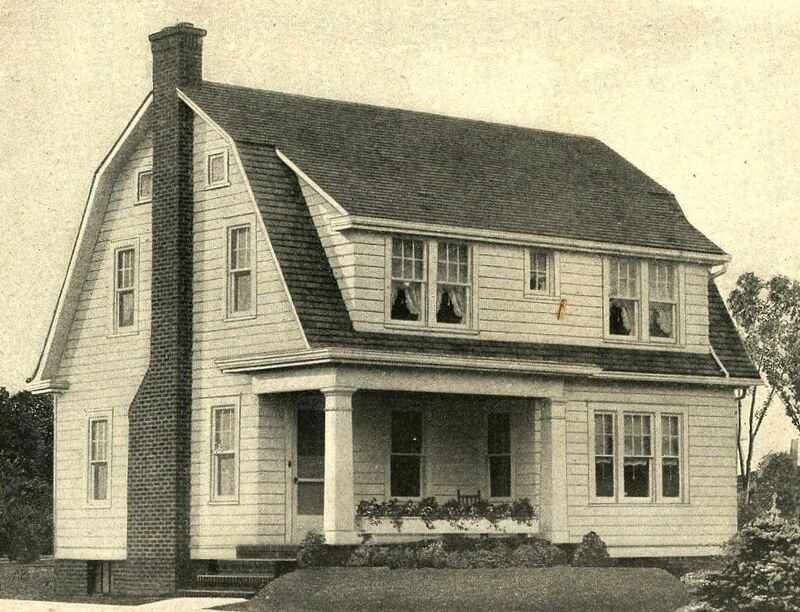 A Penniman house in Norfolk, about 1960. All of these homes had chimneys, accessible from an interior kitchen wall. The question is - why? Read more about Penniman here. Lovely Surprises in Gloucester Courthouse, Virginia! On March 9th, I visited Gloucester Courthouse (a small city bordered by the York River and the Chesapeake Bay), to do a little research on Penniman. The Gloucester-Mathews Gazette Journal is located in the historic downtown, and the paper’s proprietor (Elsa) graciously invited me to search the old editions for news of Penniman. There’s something about the feel and smell of old newspapers that is especially alluring, and in these four years that I’ve been researching Penniman and reading old newspapers, this was the first time I’d looked at anything other than microfilm. Perhaps best of all, I had the opportunity to meet Lori Jackson Black, a professional genealogist and historian. 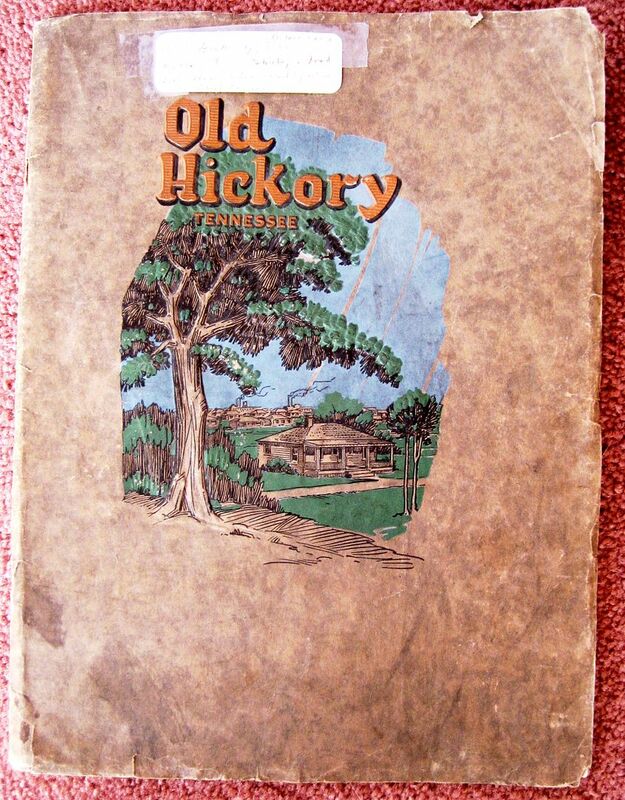 She agreed to help me look through the old papers in search of tidbits on Penniman, which was located across the York River from Gloucester Courthouse. Despite a couple hours of searching, we didn’t find too much in the local papers, but Lori and I had lunch at Oliva’s, almost next door to the newspaper office. Measured purely from a research standpoint, it wasn’t a red-letter trip (119 miles! ), but from a personal standpoint, it was 100% stellar. Just spending a bit of time at an old-fashioned newspaper office was a lot of fun. I had a chance to take a peek at the massive off-set printing press in the back of the shop (which is an amazing piece of machinery), and I got to wander around a newspaper office for a time (a happy memory from my days as a reporter), and best of all, the #1 highlight of the day was meeting Elsa and Lori. Both women care deeply about their community and its history. Meeting folks like that is always inspiring. On the 90-minute drive back to Norfolk, I reflected on the visit, and contemplated the happy fact that there are still plenty of history-loving folks out there, working quietly behind the scenes to make sure the unique history of their town is not forgotten. By the way, while I was there, I found a fine-looking Aladdin “Kentucky” and a perfect Gordon Van Tine #594. Enjoy the photos! To subscribe to the Gazette-Journal, click here. Need a little help figuring out your family history? Lori can help! I was driving down Main Street when this little pretty raised its hand and softly called my name. "Oh my," I thought to myself, "haven't I seen you somewhere before?" Then I realized, the house in Gloucester Courthouse was the baby sister of the Aladdin Kentucky that I saw in Louisa, Virginia a couple years ago. In 1914, the Aladdin Kentucky was offered in two sizes: Regular and Super-sized (although I don't think they called it supersized in 1914). The larger model was 43 feet wide. And a much bigger house. 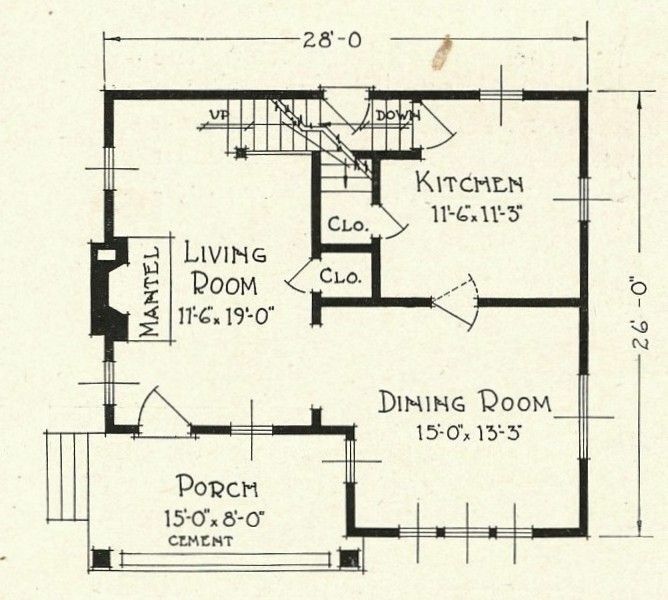 The smaller model was a mere 32 feet wide, and didn't have that kitchen off the back. 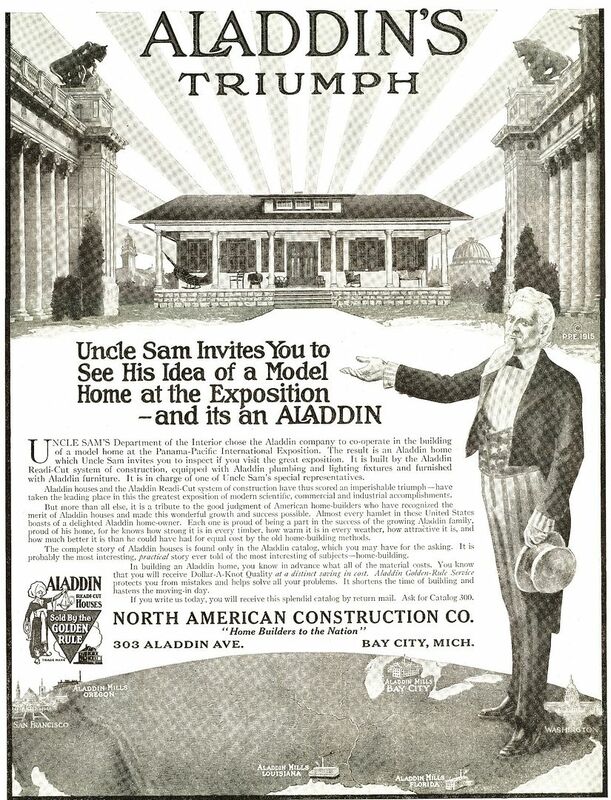 Aladdin was a company which, like Sears, sold entire kit homes through their mail-order catalog. 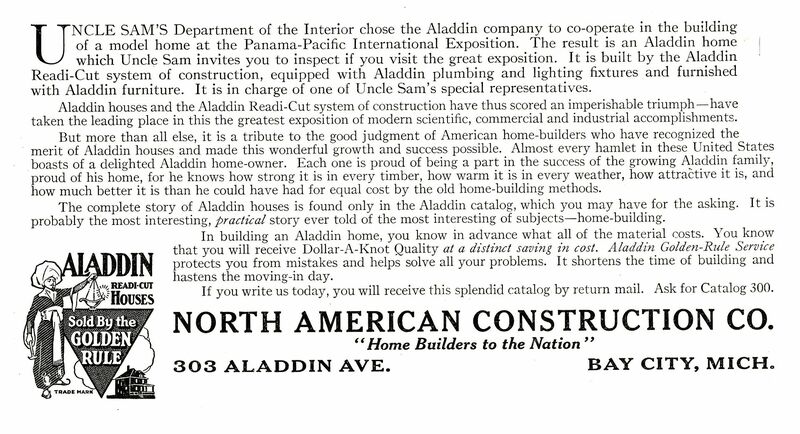 Aladdin started selling kit homes in 1906, two years before Sears. By 1940, Sears called it quits. Aladdin continued to sell their kit homes by mail order until 1981. The "Kentucky" in Gloucester Courthouse might be the smaller version. 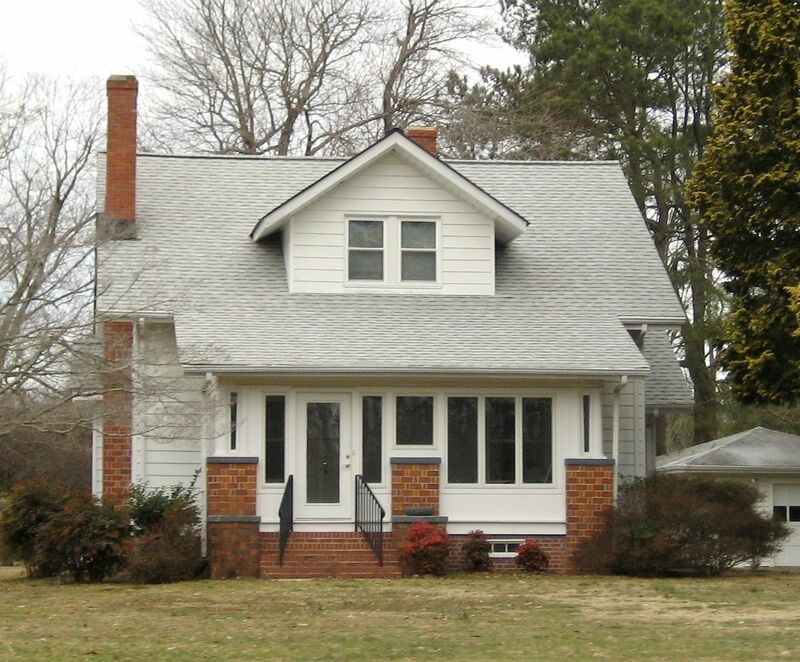 The dormer is certainly narrower than the dormer on the super-sized version (in Louisa, Va). 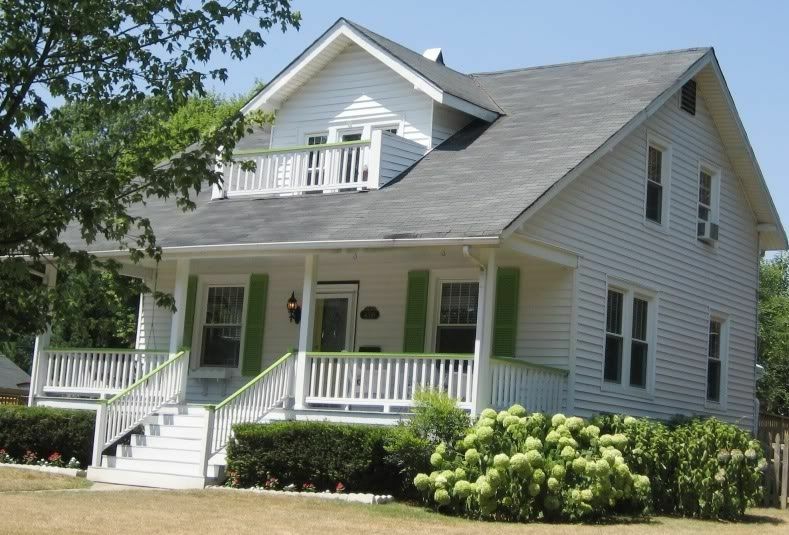 And yet, it has the six porch columns and six front windows. 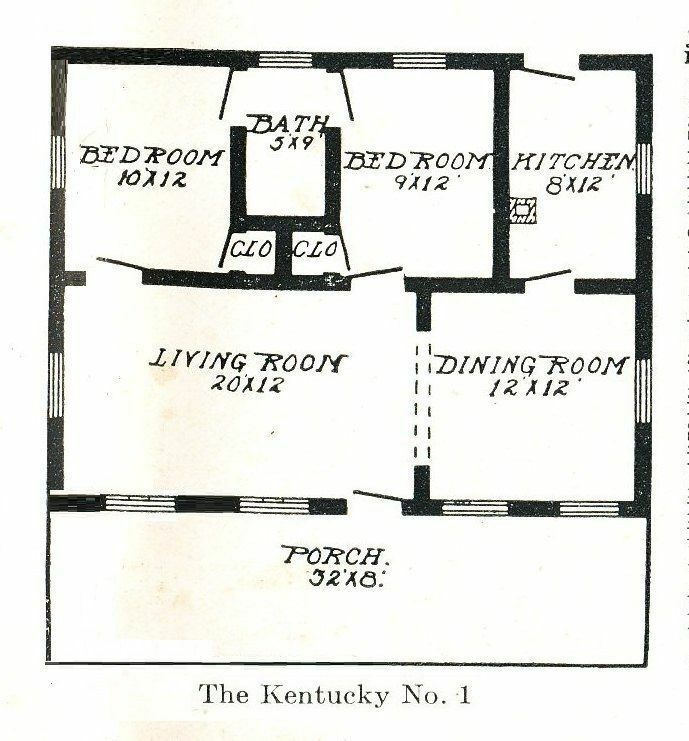 The floor plan for the "regular-size Kentucky" has four columns and four front windows. Now I'm puzzled. From the side, it sure is a nice match. But it's definitely a Kentucky! The Kentucky was built at the Panama-Pacific International Exposition. In 1915, San Francisco hosted the exposition (a nine-month event) to celebrate the completion of the Panama Canal, and to highlight the rebuilding of San Francisco after the devastating earthquake in 1906. The building of the Canal was an American achievement unlike any other, and it showcased America's fledgling hegemony. 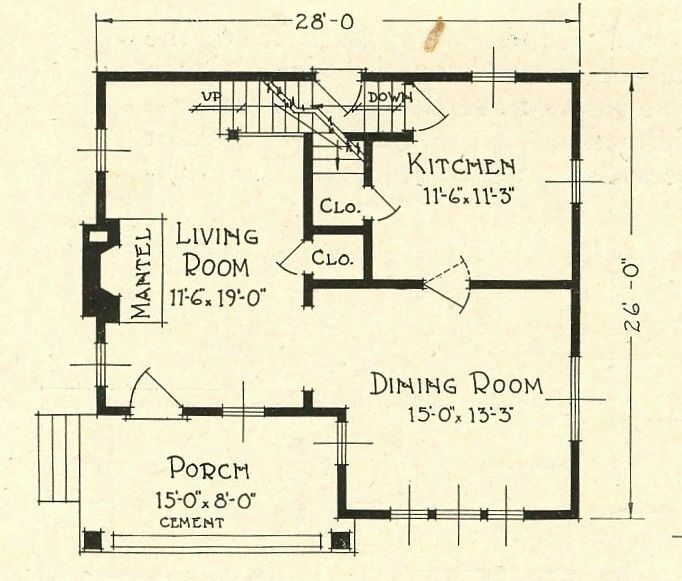 "It is probably the most interesting, practical story ever told of the most interesting of subjects - home-building." And I also spotted a Gordon Van Tine #594 on Belroi Road. 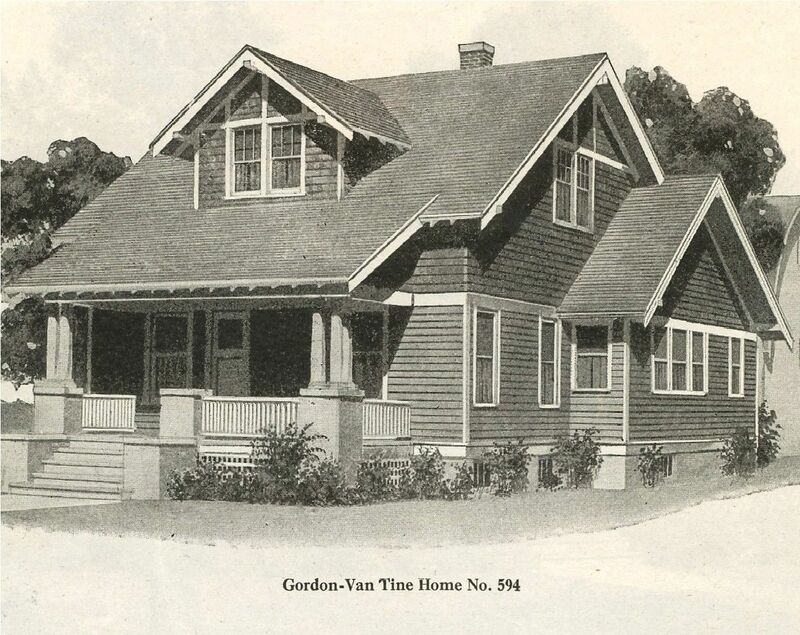 Like Sears and Aladdin, Gordon Van Tine was another national kit-home company that sold houses through a mail-order catalog. I love the GVT 594 because it's so easy to spot. 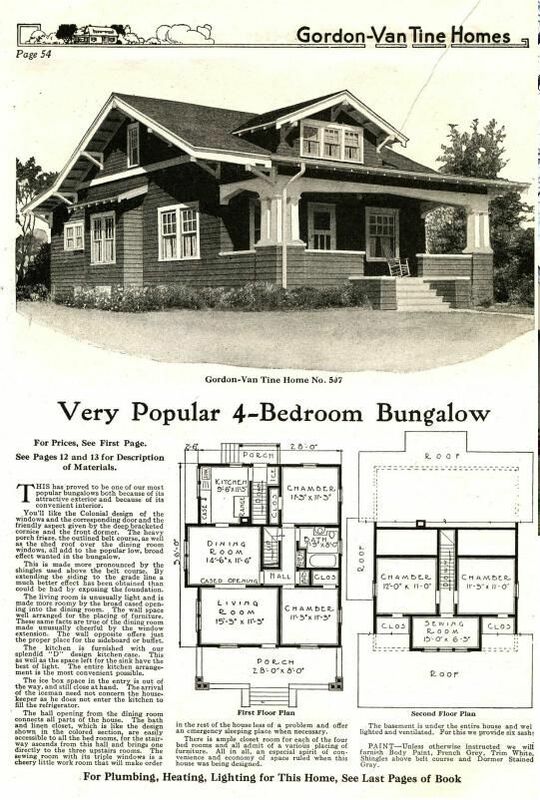 Lots of distinctive features (1924 catalog). 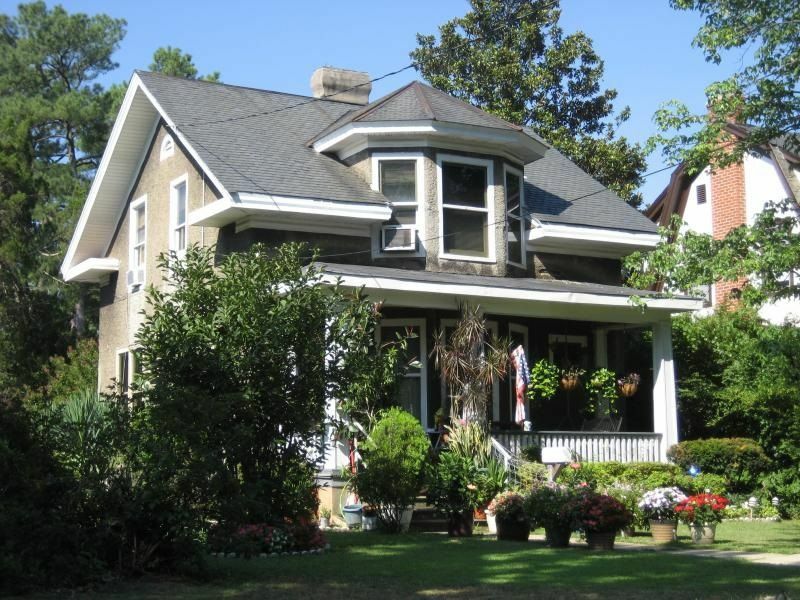 Those windows down the side always catch my eye, as does the smaller front porch roof and three porch columns. And the ad says it provides "real comfort," which is so much better than fake comfort. A massive old tree obscured the views, but peeking through the branches, you could see that distinctive bumpout, with the unusual window arrangement. Were it not for the tree, I could have done better on the angles here, but you can see they're a nice match! Check out the detail on the front porch! Very pretty! But here's the $64,000 question that got me started on Gloucester Courthouse: Did any of the 200+ houses from Penniman end up in Gloucester Courthouse or surrounding areas? I suspect they did, but I don't know where. I didn't see any in Gloucester Courthouse when I was there. 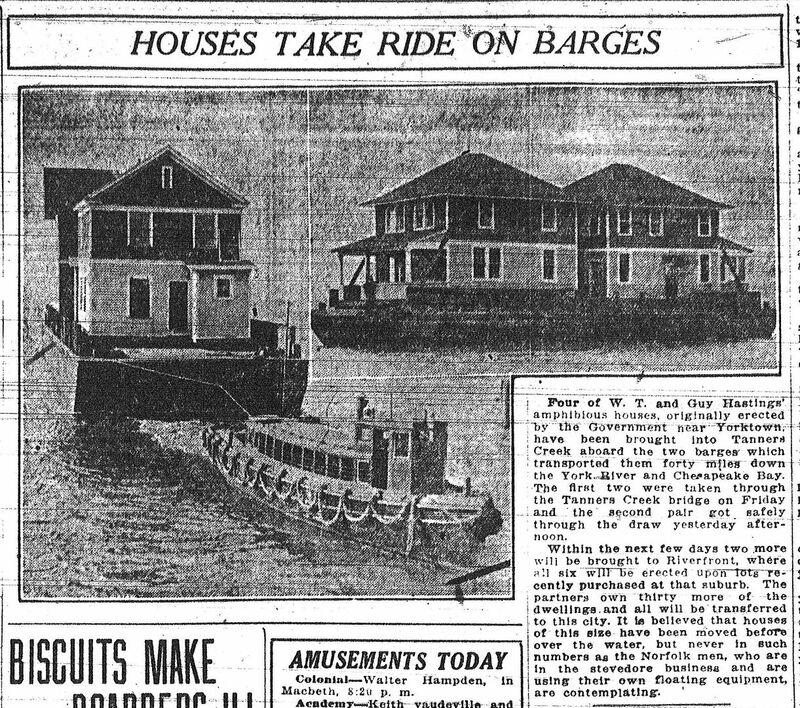 Picture is from the "Virginian Pilot" (December 1921) and shows houses from Penniman being moved to Norfolk's "Riverfront" area. And a final happy note about Lori: I’ve spent four years researching Penniman, but when I got home, I found she’d sent me a few emails. Doing a “little poking around,” Lori had found more than a dozen wonderful documents on Penniman that I’d never laid eyes on before! I can personally attest to the fact that she’s an exceptional researcher! Contact Lori by clicking here! 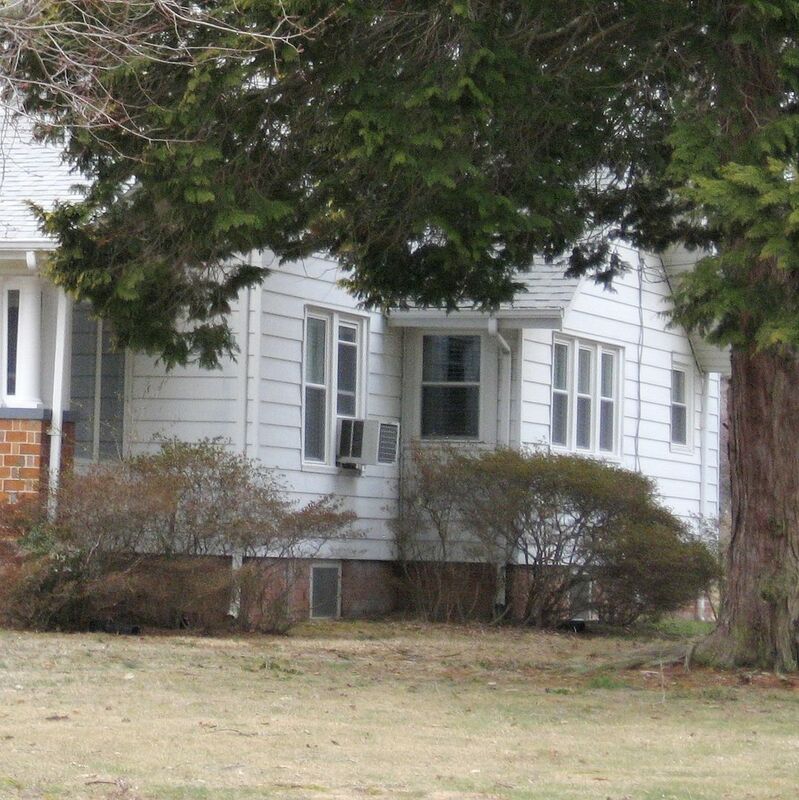 Do you know of a Penniman house in Gloucester County? Please contact Rose by leaving a comment below. For four years, I’ve been researching Penniman, and still, the most wonderful surprises keep popping up. 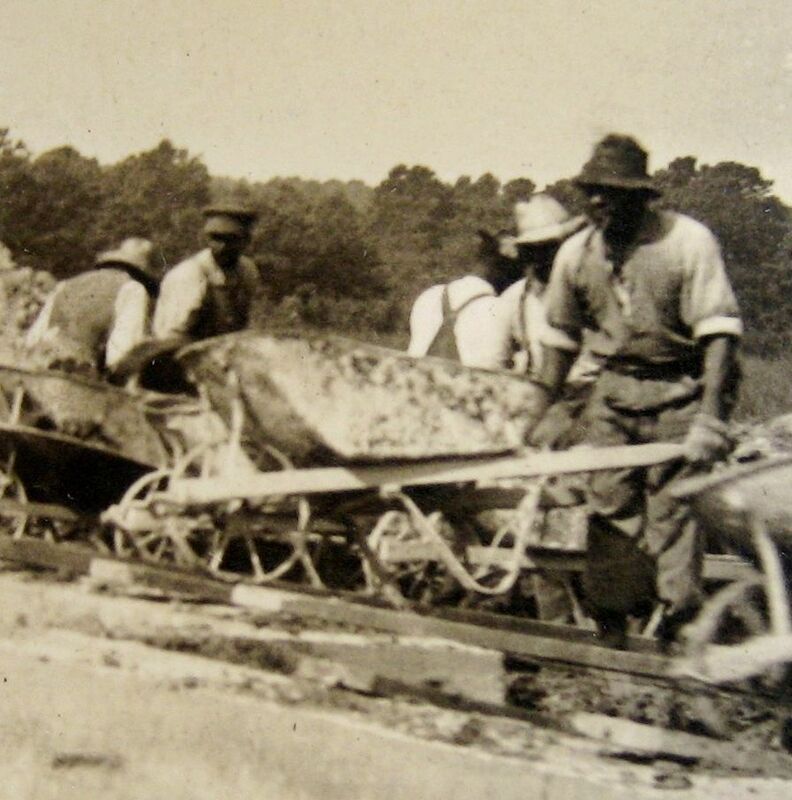 Last week, fellow history buff Mike Powell discovered a wonderful article in the Peninsula Enterprise (Accomac, Virginia) about moving houses from Penniman to Norfolk. It was dated December 24, 1921. Emboldened by this enchanting discovery, I dragged my buddy Milton Crum down to the Newport News Public Library to see if we could find anything more in the local papers about these houses being moved. At this point, all we’d seen was the blip in the Virginian Pilot (with photo) from December 5th, 1921 (see below). 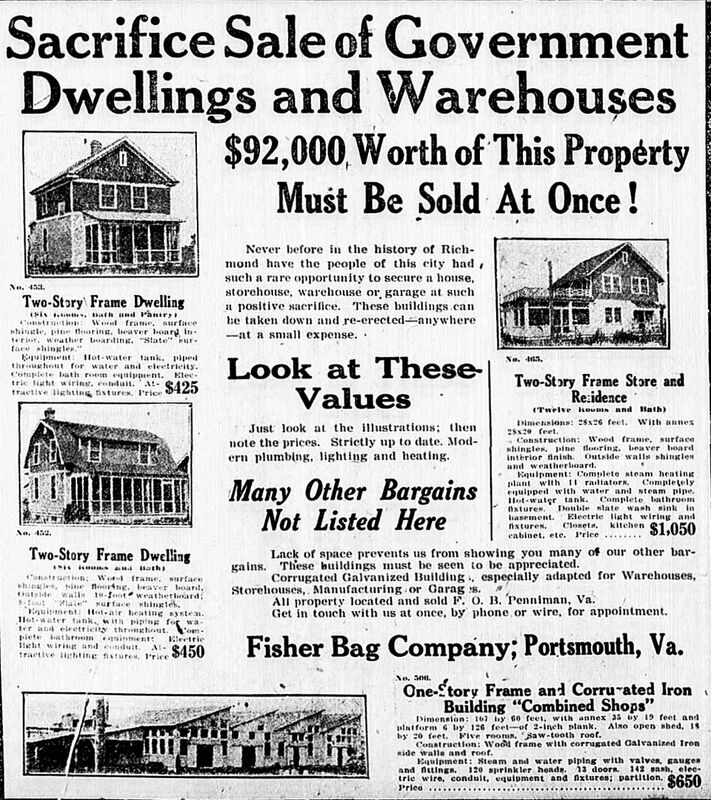 Lo and behold, Milton discovered an indepth article in the Newport News Times-Herald (November 23, 1921), which included a lot of specific information on the mechanics of moving a house - by barge - in 1921. W. T. and Guy Hastings purchased 31 more residences built by the government…The purchase of the 31 houses is the result of the success met in moving five, which were bought from the government some weeks ago. The article goes on to say that they started with a tractor, and using wooden logs and cast-iron pipe, they moved the houses down to the waterfront. Later, they used a steam derrick and made better progress. From this account, I also learned that the houses were “scattered about at Penniman,” and the average distance from house to riverfront was about four blocks. And it’s within this article that we learned that the government built 275 houses at Penniman. The article found by Mike Powell in the Peninsula Enterprise offered some interesting insights, too. W. T. Hastings of Norfolk has just moved eight houses across the Chesapeake Bay to Norfolk, a distance of about 24 miles. 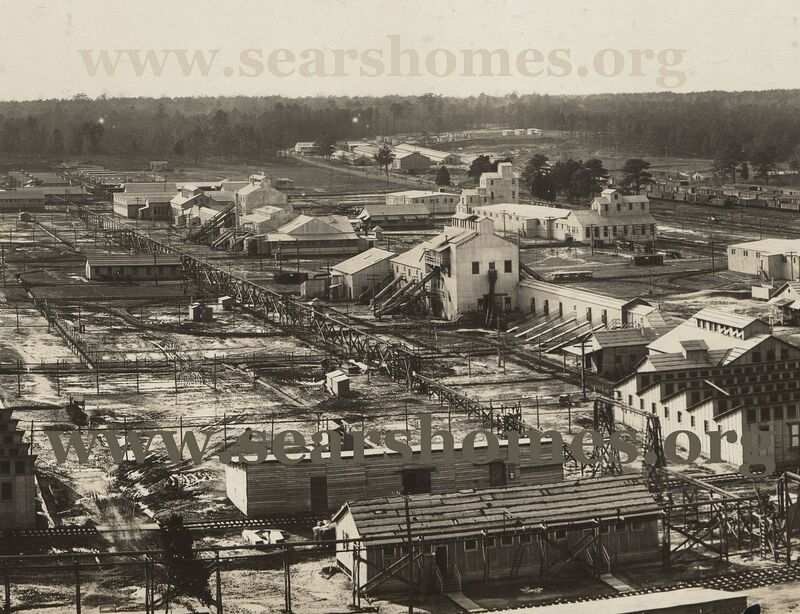 During the war, the government built a war city at Penniman. All of these houses are of the very best material and are so well constructed that they could not be demolished without wrecking them beyond repair. It goes on to say that Hastings had originally intended to disassemble the houses and rebuild them elsewhere. 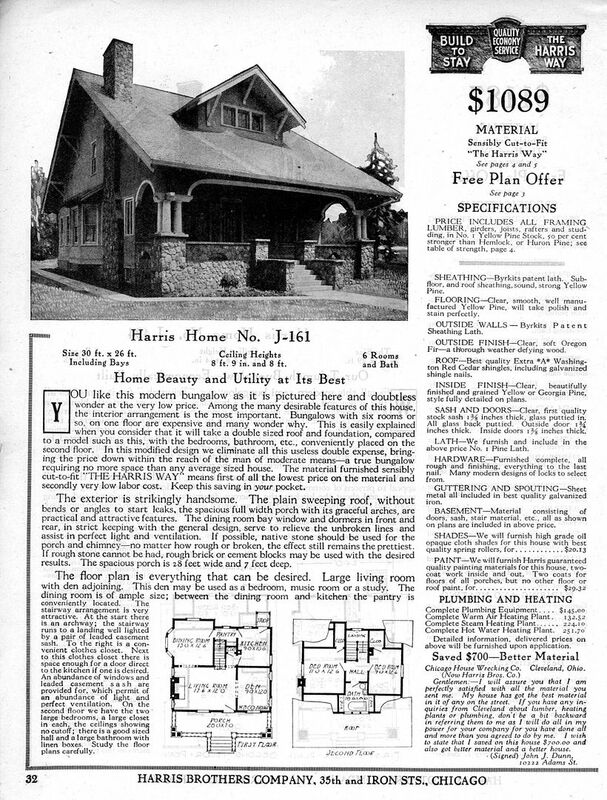 [Hastings] found that the houses had been built on the cost-plus plan, and there were so many nails in them it would mean almost total destruction to tear them down. Several workmen crossed the bay on the first barge that brought the houses. They had an oil stove in one of the houses. They got hungry and decided to cook some bacon and eggs. They also heated some coffee. They enjoyed a meal cooked in one of the houses while it was being towed to Norfolk. Today, almost 100 years later, I’ve found more than 60 of these houses in Norfolk, about two dozen in Williamsburg (most of which have been torn down) and that’s it. I know there are more, but finding them is proving quite difficult. 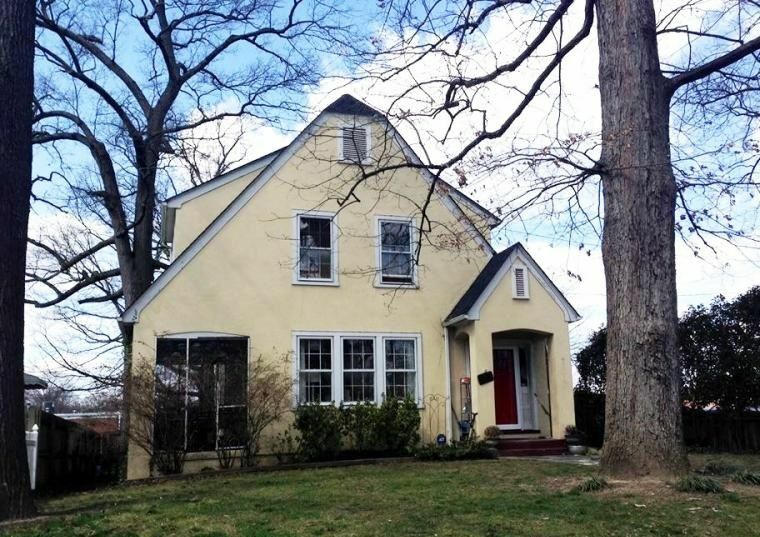 The good news is, there’s one for sale right now in Williamsburg, and it’s a mere $900,000. Inch by inch, I’m working on completing my manuscript on Penniman. It’s slow going, but there is some progress every day. Join the fun! If you’ve found any amazing articles about Penniman, please drop me a note at Rosemary.ringer@gmail.com! Penniman was quite a place. At its peak, there were 15,000 people living and working within its borders. That's the York River in the background. Photo is courtesy Hagley Museum and Library. Built as a shell-loading plant for WW1, Penniman was short lived. Three years after DuPont agents first started buying up farm land on the York River, it was all over and Penniman was sold off. 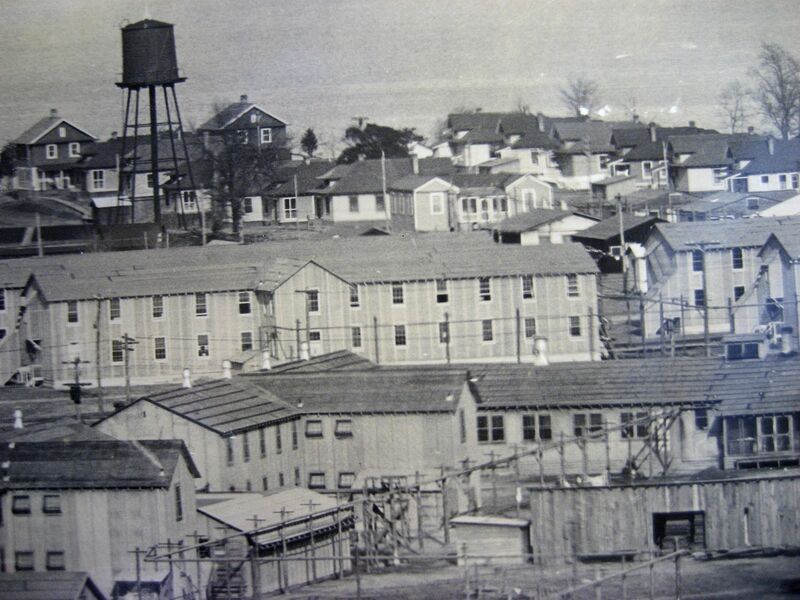 More than 60 of the two-story houses built at Penniman ended up in Norfolk. Photo is courtesy Hagley Museum and Library. At Penniman, workers filled 155mm and 75mm shells with TNT and Amatol. You'll notice that some of these buildings have two-story chutes leading to the ground. Alice Hamilton was a female physician and researcher who studied the problem of TNT poisoning in WW1 in America, and she wrote a book titled, "The Dangerous Trades." In that book she talks about touring a plant like Penniman and was told that she should keep alert to sparks from static electricity, and if she saw one, "Dash for that door and slide down and when you hit the ground, don't look behind you and keep right on running." Milton calls these, "Get the heck out doors." Photo is courtesy Hagley Museum and Library. The houses were built near the York River (at top of page). Our Ethels are by the water tower (far left). Photo is courtesy Hagley Museum and Library. Here's a close-up of The Haskell, which was built at Dupont Munitions Plants in Penniman, Hopewell (Virginia), Old Hickory, Tennessee, Carney's Point, New Jersey and more. Many Penniman Haskells ended up in Norfolk. In fact, Mr. W. T. Hastings moved into one of the houses that he shipped in from Penniman, and gifted several of the houses to family members. This photo was taken about 1937. He's missing his hat. I hope he didn't lose that bet. 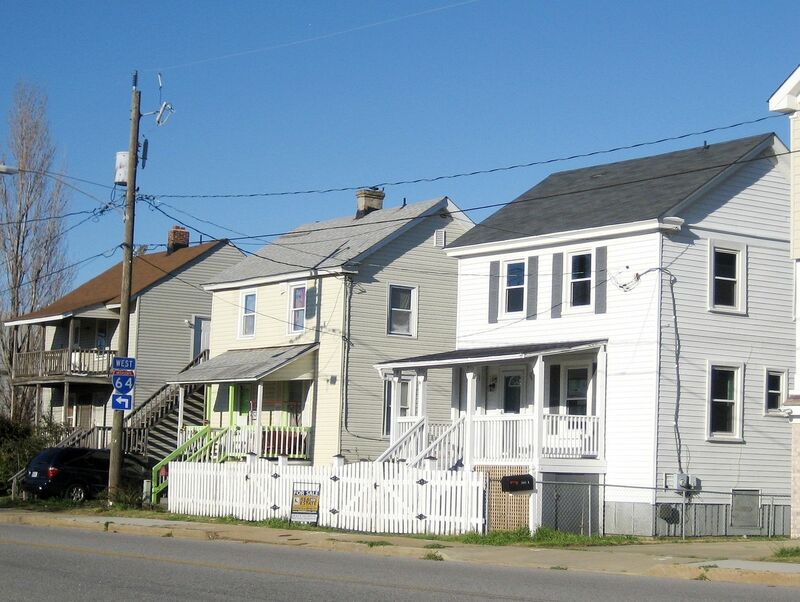 Three Haskells were moved to Ocean View, to 13th View Street in Norfolk. 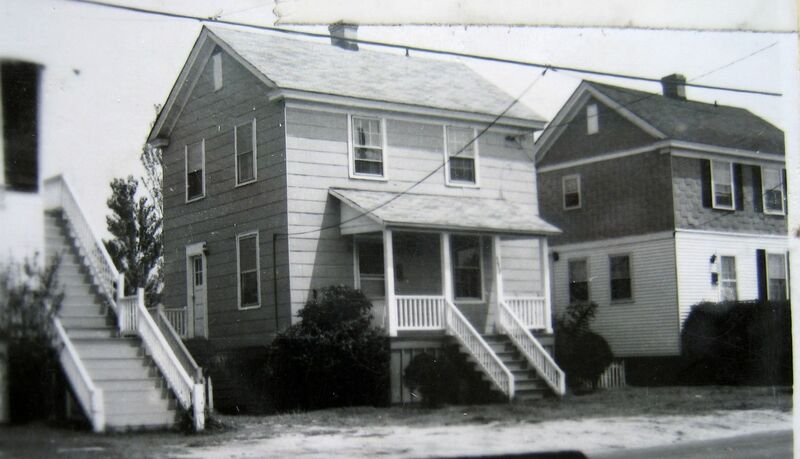 Here's a glimpse of the three Haskells about 1969 (Norfolk Tax Assessor's Office). Here are Mr. Hastings' homes floating down the Chesapeake Bay. This is from the "Virginian Pilot" (December 5, 1921). 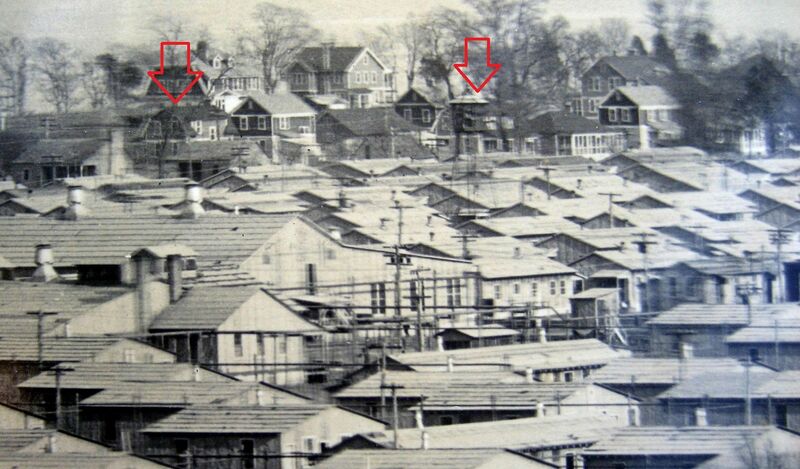 According to these newspaper articles, the houses moved by Hastings were up to four blocks in from the York River. 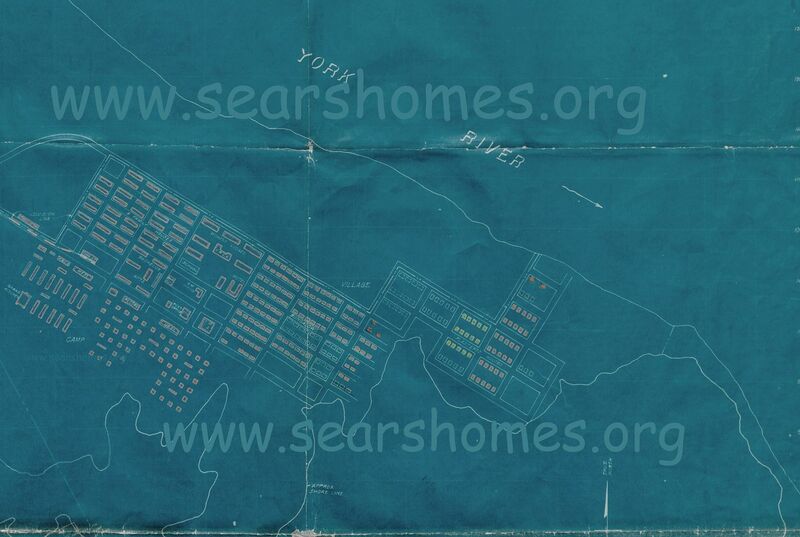 This map shows - in detail - the location of the residences in Penniman. Photo is courtesy Hagley Museum and Library. One of the choicest tidbits in these articles is the story that the workers cooked a nice breakfast on the oil stove in the Penniman house. Why did the engineers/architects decide on oil cook stoves for their little houses? 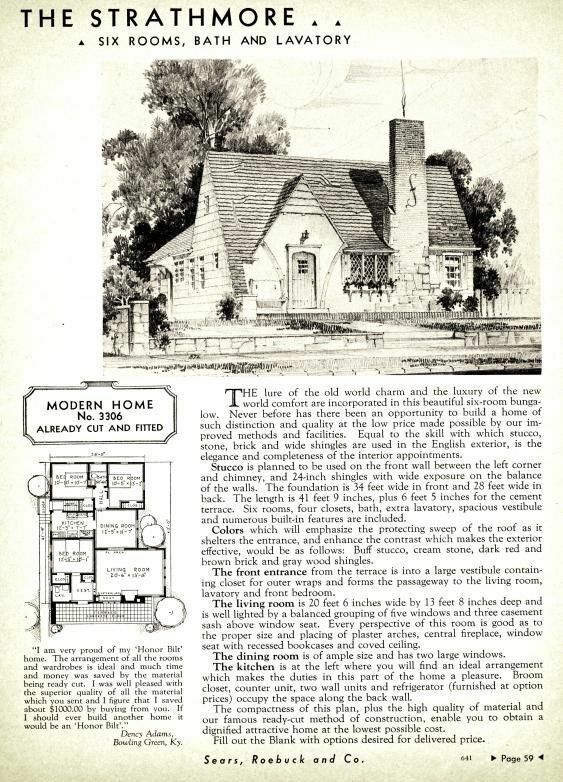 Without exception, every house that DuPont erected in a WW1 munitions plant had a centralized steam heating plant (for obvious reasons), but why an oil cook stove? 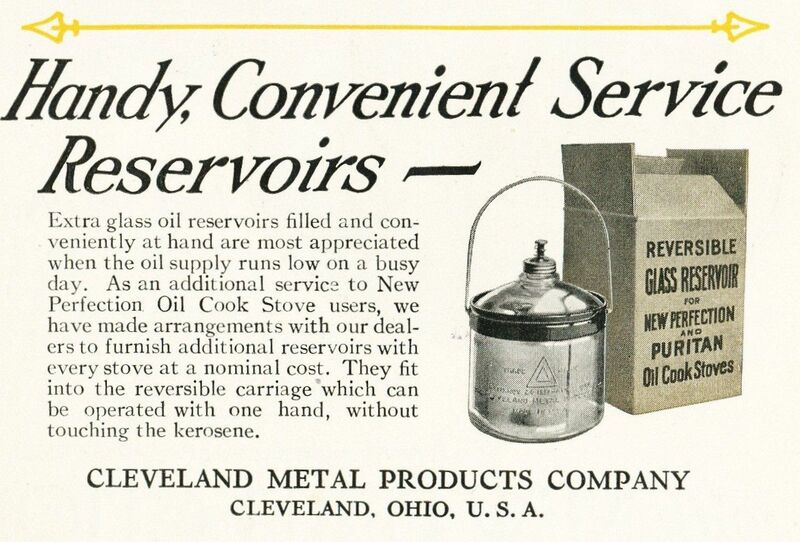 I've read that the oil cook stove was very efficient. 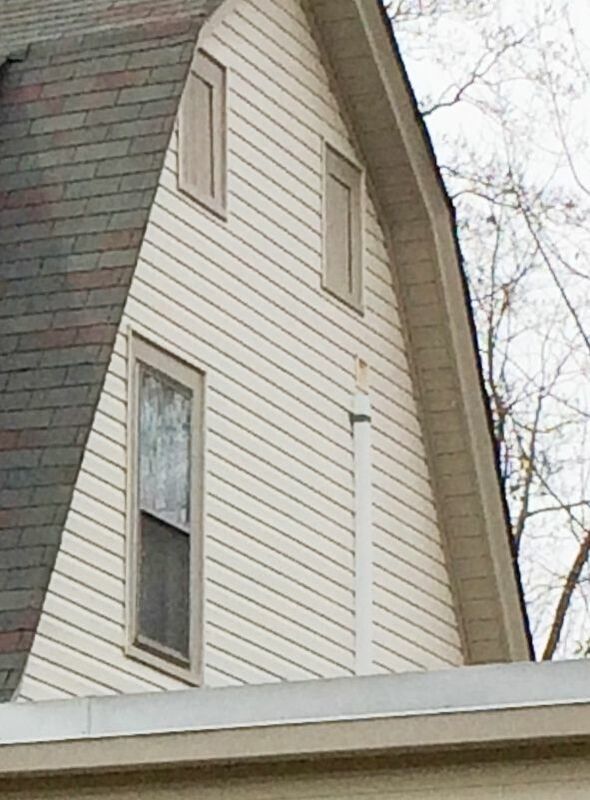 Was this a way to make sure there were no embers flying out the chimney? I wish I knew. Mr. Jones, Where Are Your Lovely Photos? 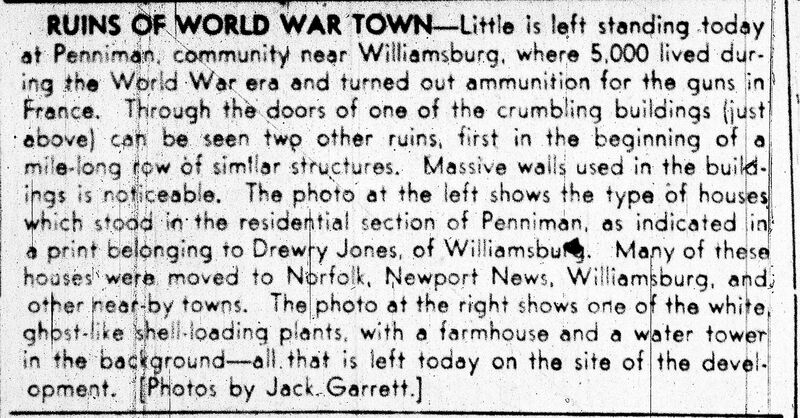 In that process of rummaging through my notes on Penniman, I was reminded that I’d been looking for photos taken by Drewry Jones of Williamsburg. Despite lots of poking around, I never have been able to locate those photos (originals or reproductions), or anyone who has even heard of Mr. Jones’ collection of photos. The photos appeared in the Richmond Times Dispatch in an indepth article on Virginia’s Own Ghost City: Penniman (June 1938). 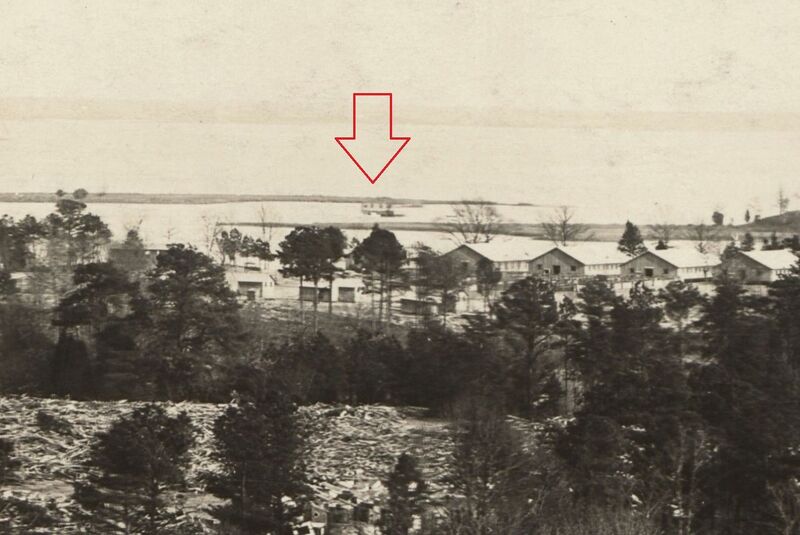 The article featured a wide photo of Penniman’s village (with all those little houses). Despite two trips to Hagley Museum and Library (in Wilmington, Delaware) and several billion trips to area museums and libraries, I’ve never seen anything like those photos. 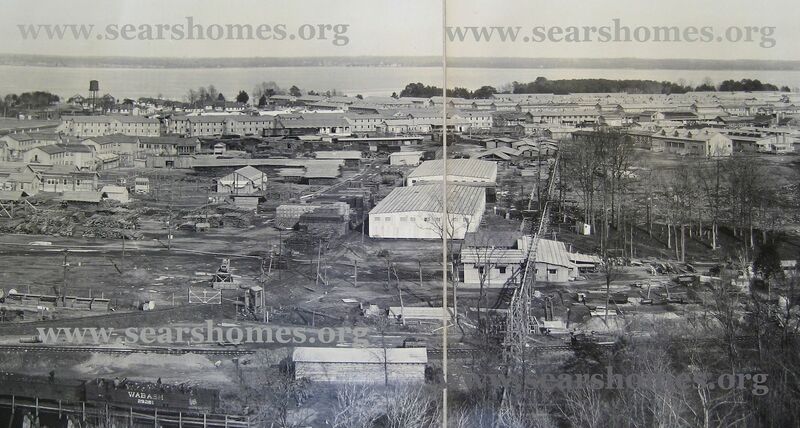 They were truly unique in that they captured a great view of Penniman’s residential village. Augustus Drewery (sometimes spelled “Drewry”) danced off this mortal coil on April 8, 1977. His obituary was published in the Newport News Daily Press on April 10, 1977, and named two nephews as his lone survivors. I’ve sent two letters to Mr. Jones’ only surviving nephew (”Dr. John M. Pitman” of Williamsburg) and haven’t heard a peep. That was 18 months ago. Augustus Drewery Jones of Williamsburg died Friday in a Williamsburg Community Hospital after a long illness. A lifelong resident of Williamsburg, Mr. Jones was a graduate of the College of William and Mary. After a long career with the Peninsula Bank and Trust Company, he was appointed state treasurer of Williamsburg-James City County and retired from office in 1959. He was past chairman of the board of deacons and ruling elder of Williamsburg Presbyterian Church, a member of the Association for the Preservation of Antiquities, the Pulaski Club, Sons of American Revolution, Williamsburg Rotary Club, and a former member of the Williamsburg Rotary Club. Mr. Jones loved Penniman. 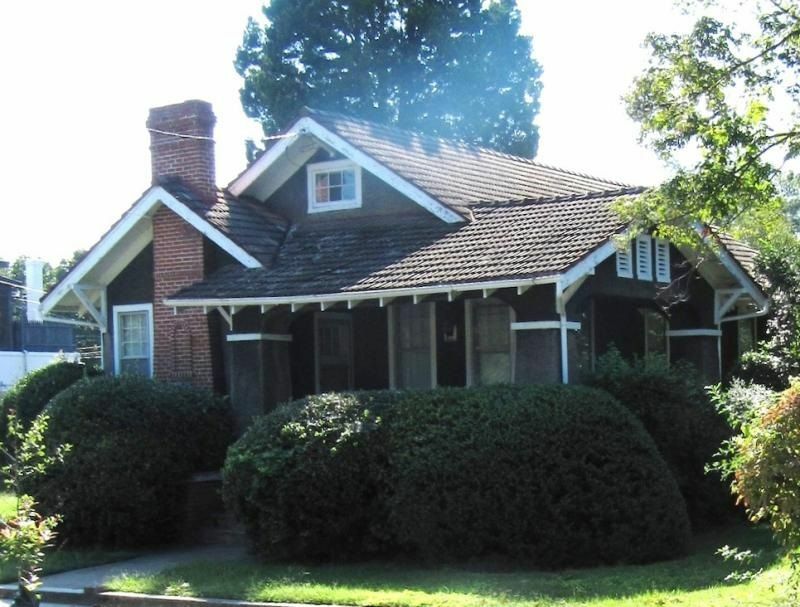 In fact, in the early 1920s, he had one of the old Penniman houses moved to a lot on South England Street, and he lived there until his death. In fact, that house is currently for sale! Click here to see pictures! And he owned photo(s) of Penniman - that he shared with the Richmond Times Dispatch - which were taken from an angle that I’ve not seen anywhere else. 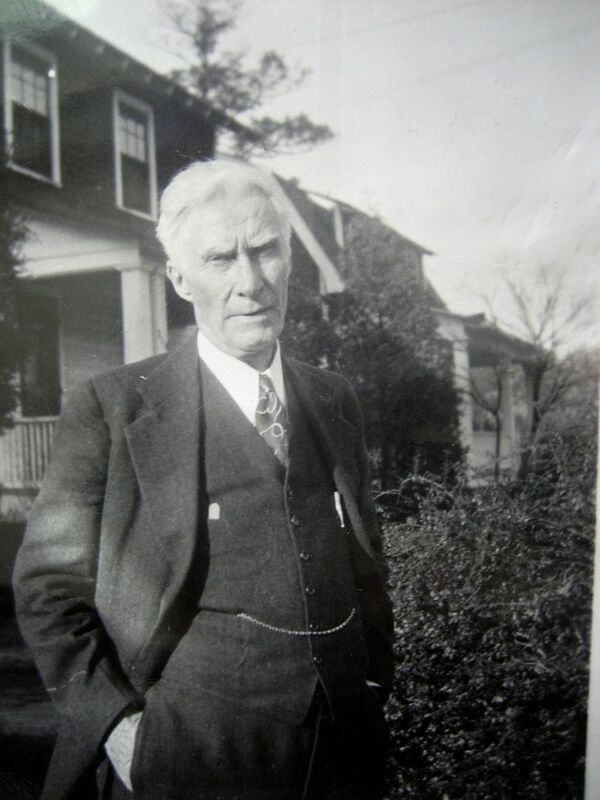 Drewry Jones was fairly well-connected, as an alumn of William and Mary College, a banker with the Peninsular Bank and Trust Company and state treasurer of James City County. Someone somewhere must know this fellow. I’d be so grateful if anyone could help me find out what became of Mr. Jones’ collection of photos. For the intrepid researchers here, below is a list of where I have already checked for these photos. So where are Mr. Jones’ photos? 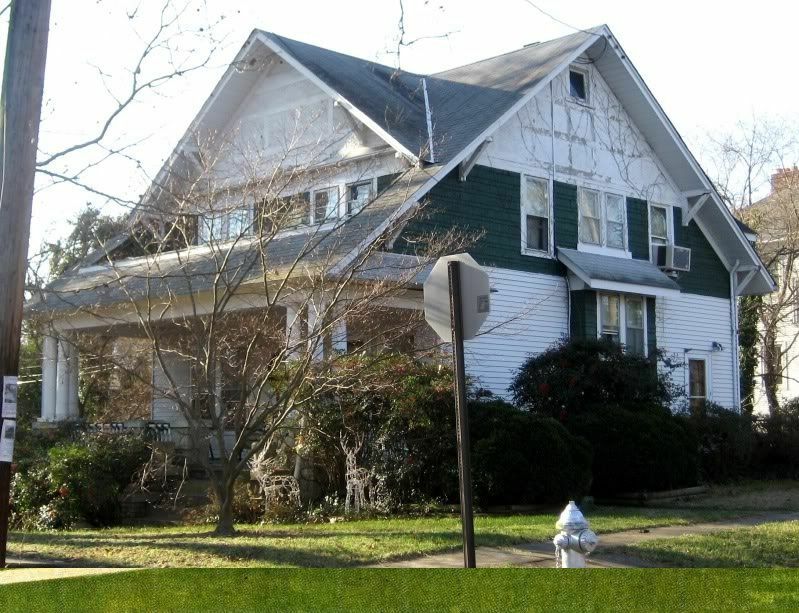 There are a handful of Penniman houses in Williamsburg. Click here to learn more. 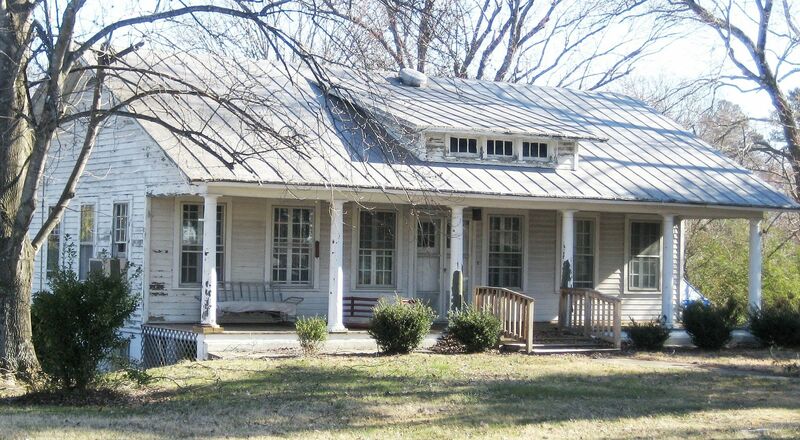 See the interior of Mr. Jones’ home by clicking here. Here's a grainy reproduction of Mr. Jones' photo, as seen in the Richmond newspaper (June 2, 1938). Here's the original newspaper reference to "a print belongin gDrewry Jones of Williamsburg" (RTD, June 2, 1938). If you squnit your eyes a lot and look closely at this photo of Penniman (1918), you can see two of the DuPont "Georgias" in the photo. As one historian said, "Penniman was not erased, it was dispersed." Many of these houses were moved to nearby cities. Photo is courtesy Hagley Museum and Library. 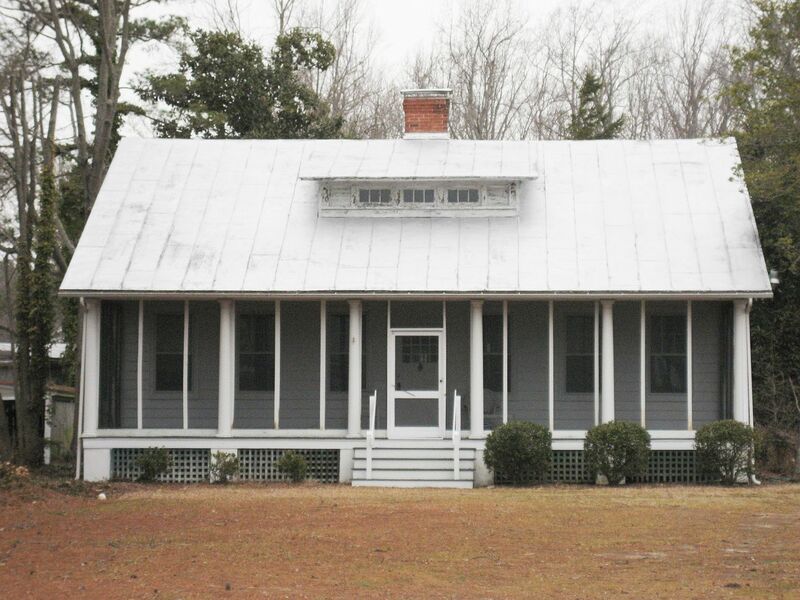 Drewry's house was a DuPont design, The Georgia." Drewery loved Penniman. 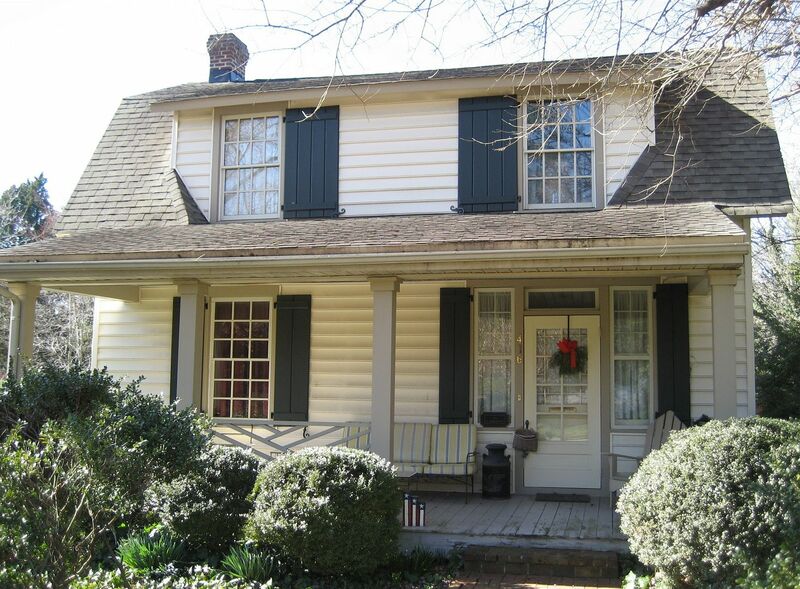 He purchased this house from DuPont's 37th munitions plant on the York River, and had it moved to Williamsburg. Drewery lived in this house on South England for many years. After Mark Hardin first spotted this house, we traveled out to Williamsburg to see it "in the flesh." It's had some pretty substantial additions added onto it in the intervening 90 years. 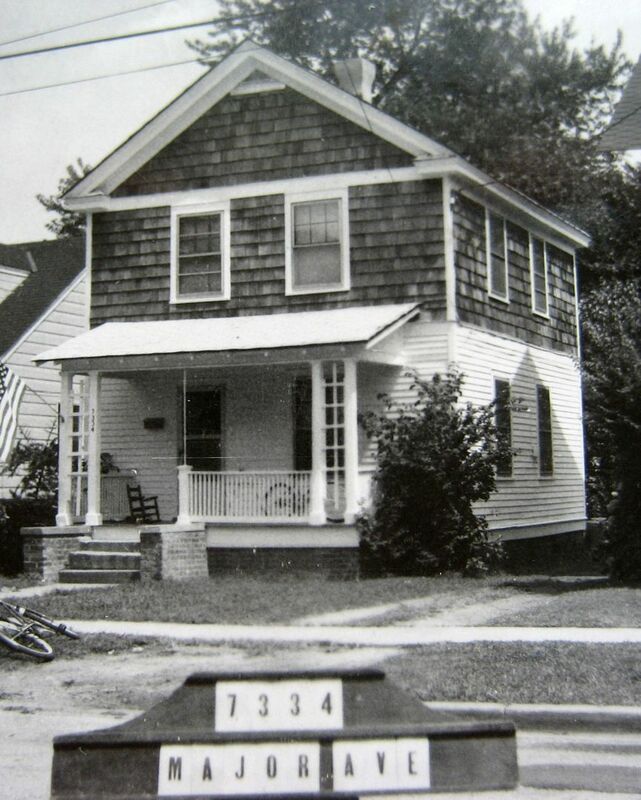 Here's a Georgia that started life at Penniman, and landed (with 64 other Penniman houses) in Norfolk, Virginia. 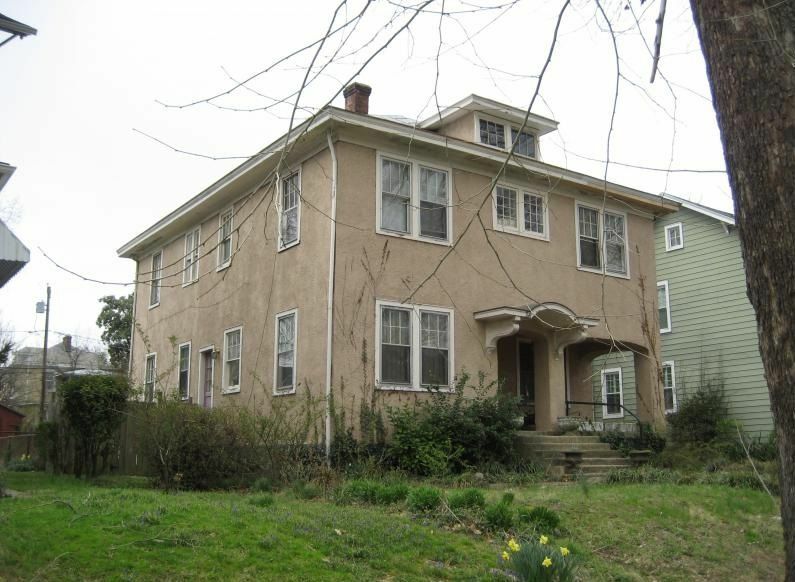 The houses were shipped by barge from Penniman to the Riverfront neighborhood in Norfolk (Glenroie Avenue and Major Avenue). Notice the windows flanking the front door. 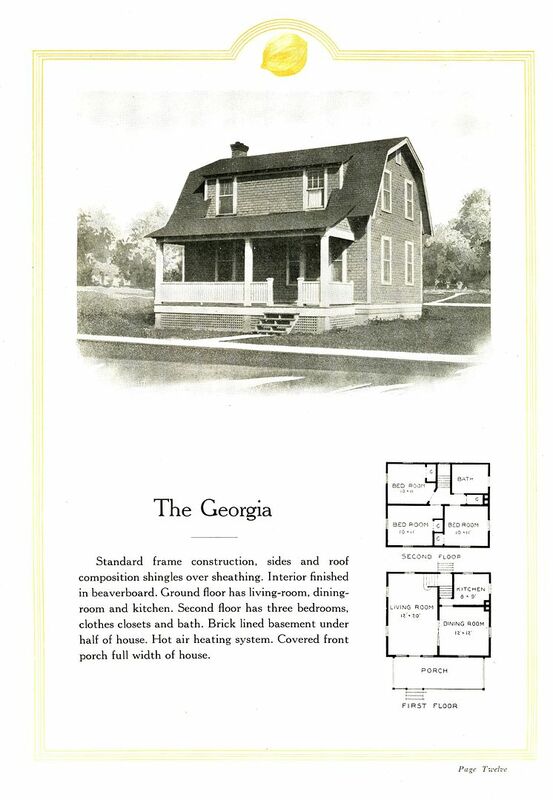 The Georgia was designed by DuPont's architects, and was *probably* built with building materials from North American Construction Company (also known as Aladdin Readi-Cut Homes). The houses were built by Hancock-Pettijohn. 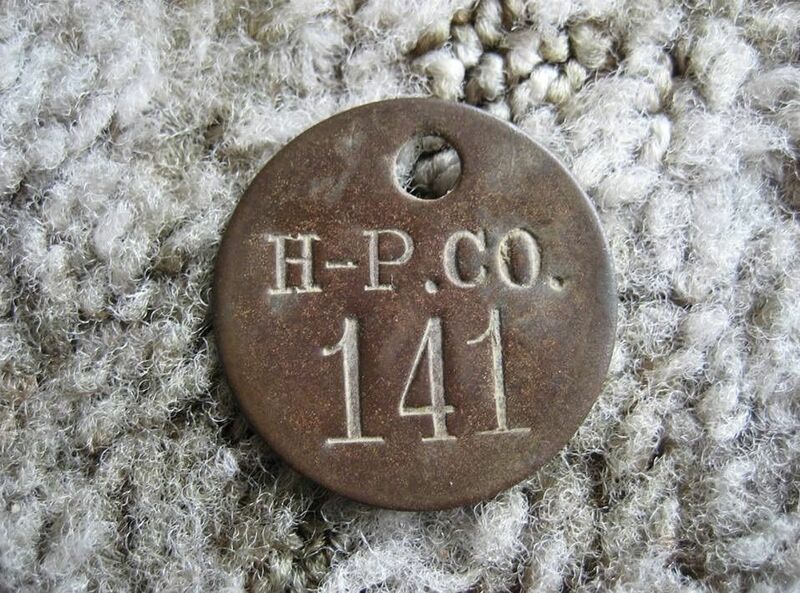 Shown below is a chit found at the old Penniman site, maybe used for checking tools out of the tool shed. The only other tidbit I have is that on March 17, 1918, this item appeared in the Virginia Gazette. 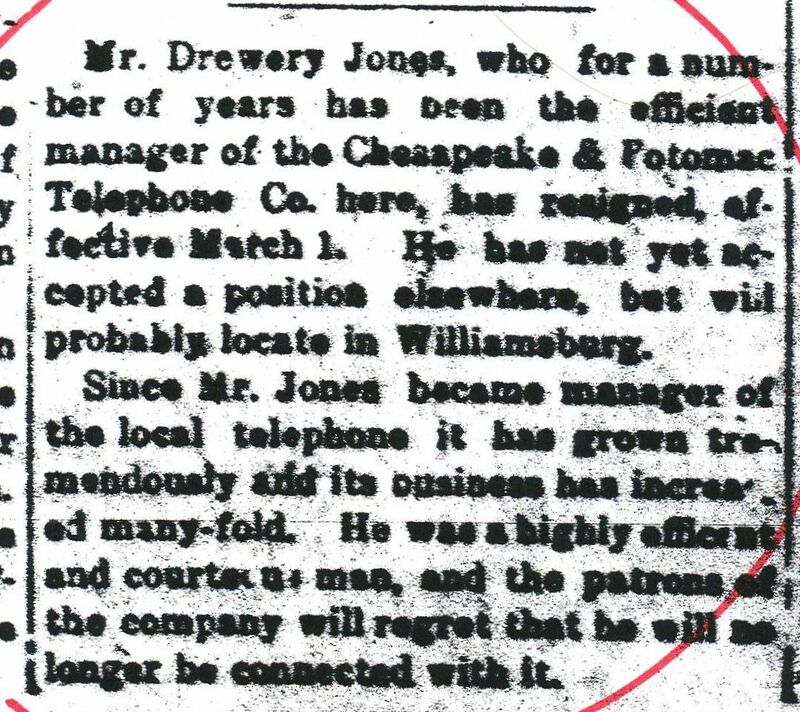 Seems Mr. Jones resigned from C&P (as manager) on March 1, 1918. And as of January 15, 1926, Mrs. Drewry Jones was chair of The Little Theater League. Incredible researcher and smart cookie Mark Hardin has made another remarkable discovery. 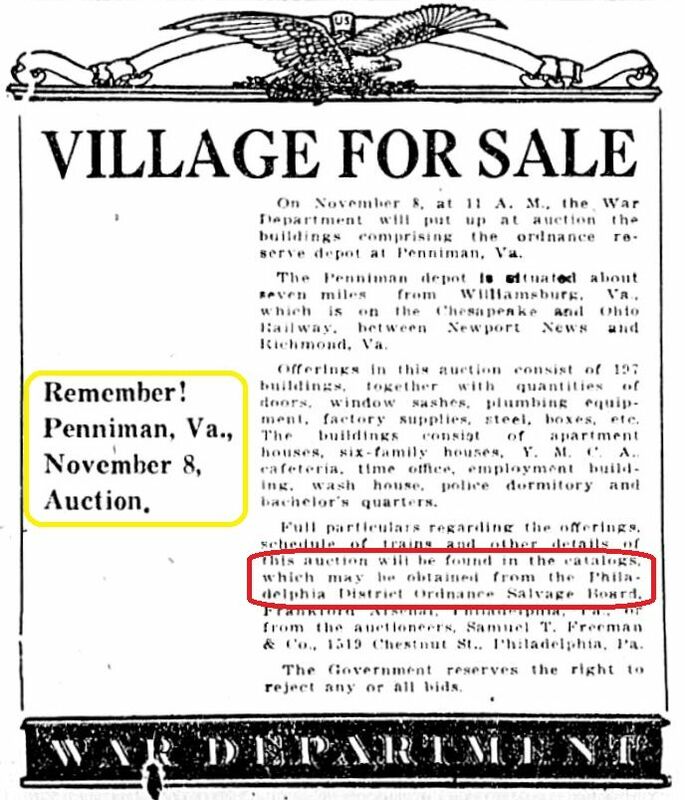 He found an advertisement (dated October 1922) in the Richmond Times Dispatch, offering the Village of Penniman for sale. By this time, most of the contents of the WW1 munitions plant had been sold off (per the terms of a contract between DuPont and the U. S. Government [dated December 1917]). All proceeds went to the U. S. Government. If anyone has any idea where I might find these catalogs, please let me know. To learn more about this amazing “Ghost City,” click here. To read about how Norfolk got tangled up with Penniman, click here. 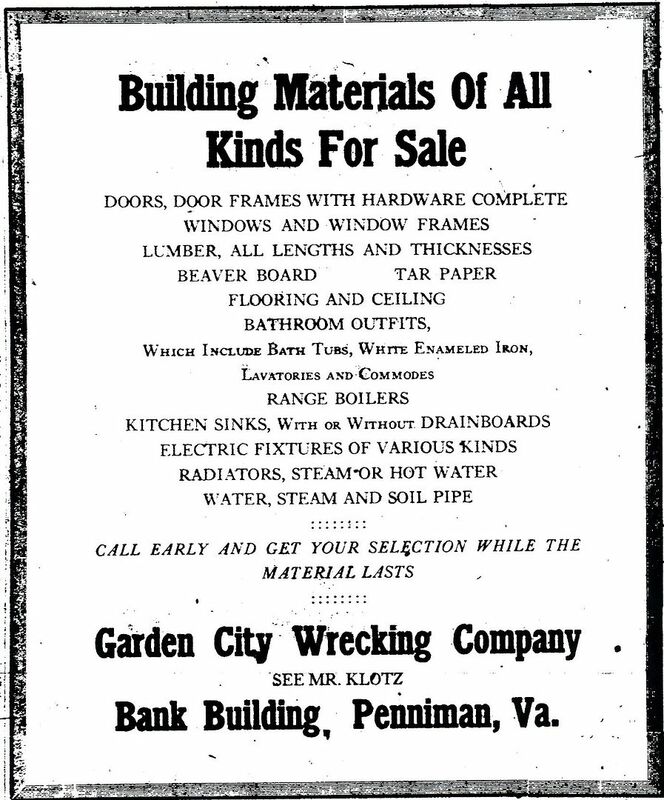 The first "salvage" ad that I've found appeared March 10, 1921 in the Virginia Gazette. An article in the Newport News Times Herald said, "Penniman was not erased; it was dispersed" (September 5, 1983). 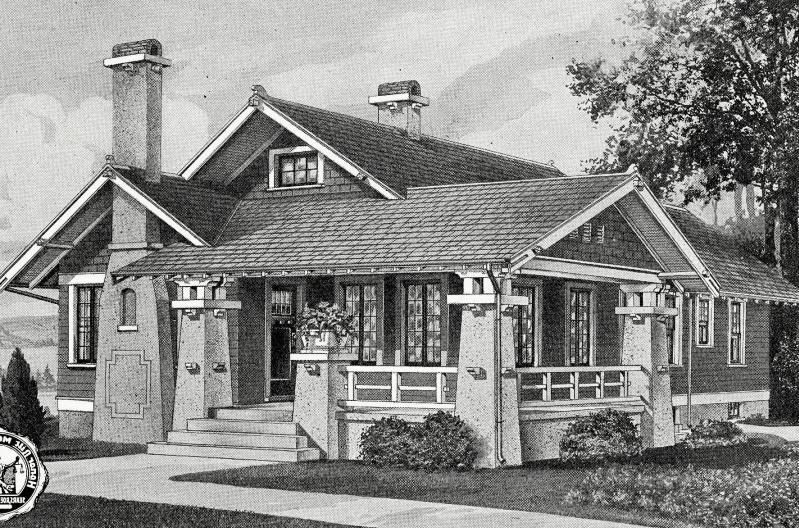 Shown here is a DuPont design, "The Denver." There were many Denvers at Penniman, and several of them were moved to Williamsburg. Unfortunately, most of them have been torn down. 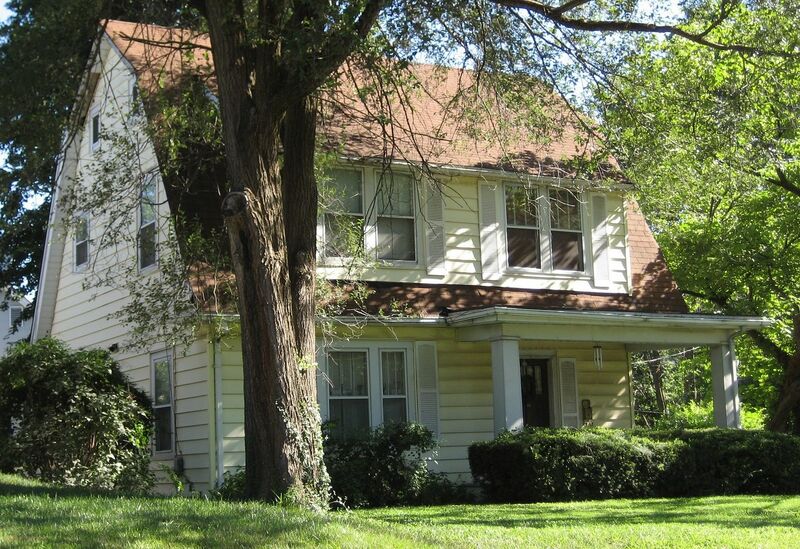 This Denver, which now rests on Capital Landing Road, originally came from Penniman. 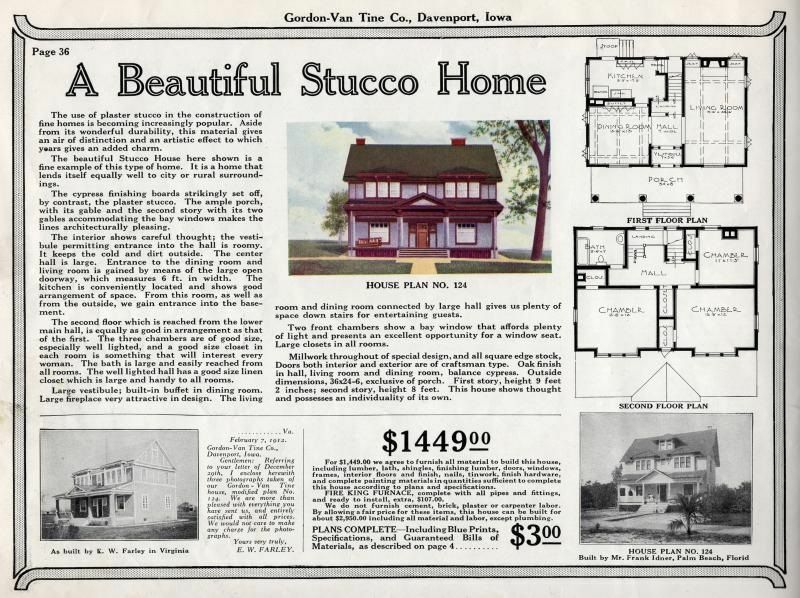 Just last month, I had the good fortune to find this late 1910s catalog of Dupont designs. On the cover, it shows a Denver in a bucolic setting, with a DuPont plant in the background. If you have any idea where I might find these catalogs, please let me know. To learn more about Penniman, click here. To read about how I became involved with Penniman, click here. 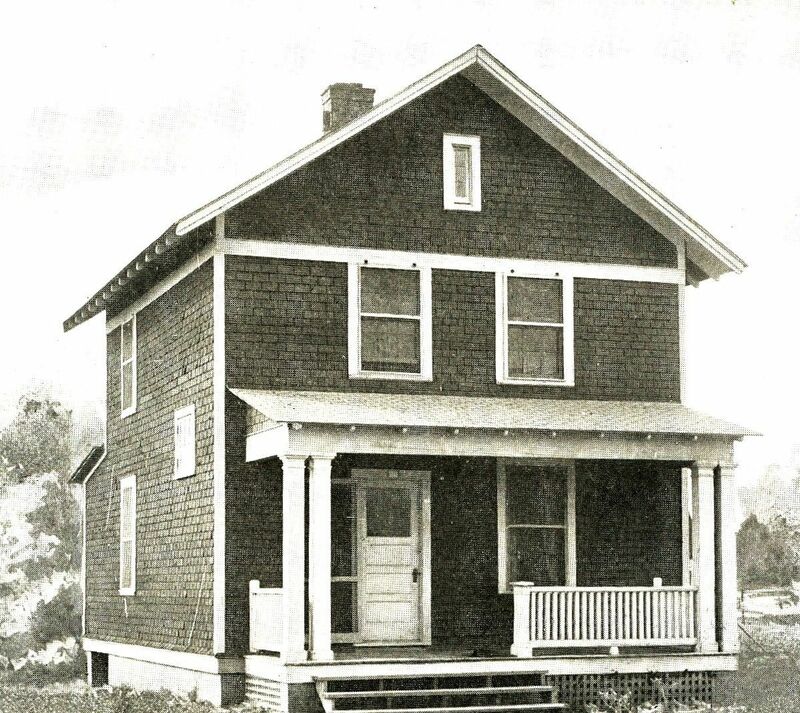 Was your great-grandfather stationed at Penniman? Click here to find out.